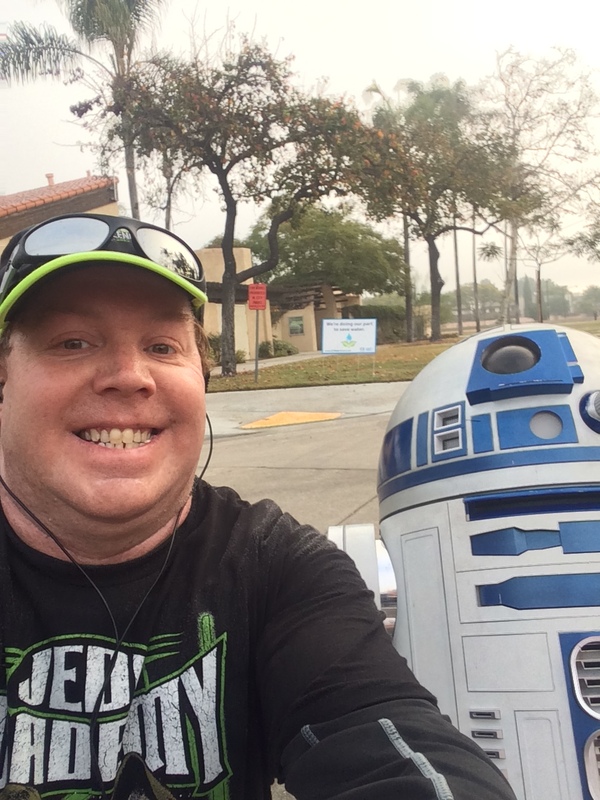 With the Star Wars 10K in the books, it was time for the big race of the weekend. 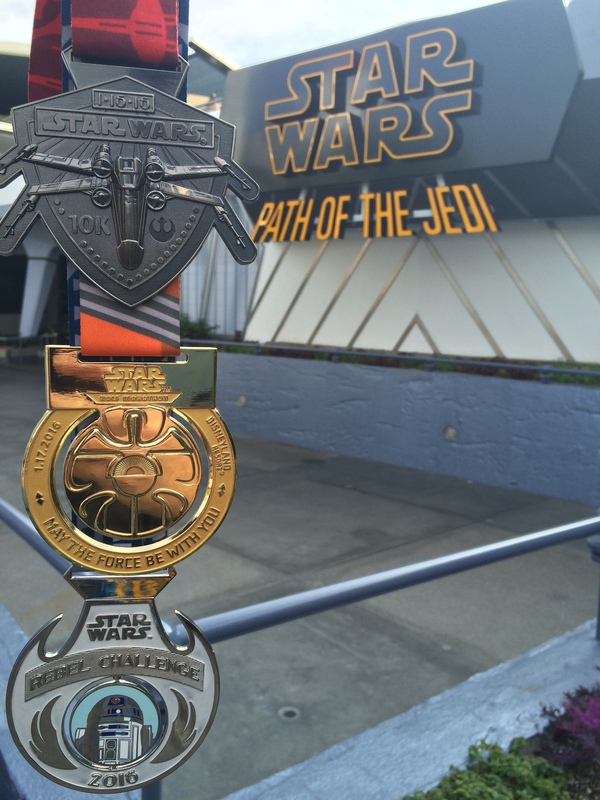 The Star Wars Half Marathon to complete the Rebel Challenge! Unlike the day before, there was no drama to start the day. My phone was fine and I had a totally uneventful trip back to the Mickey and Friends Parking Structure. I also made the decision to wear a throw away sweatshirt and break the gloves out to keep warm before the race. It made all the difference pre-race. 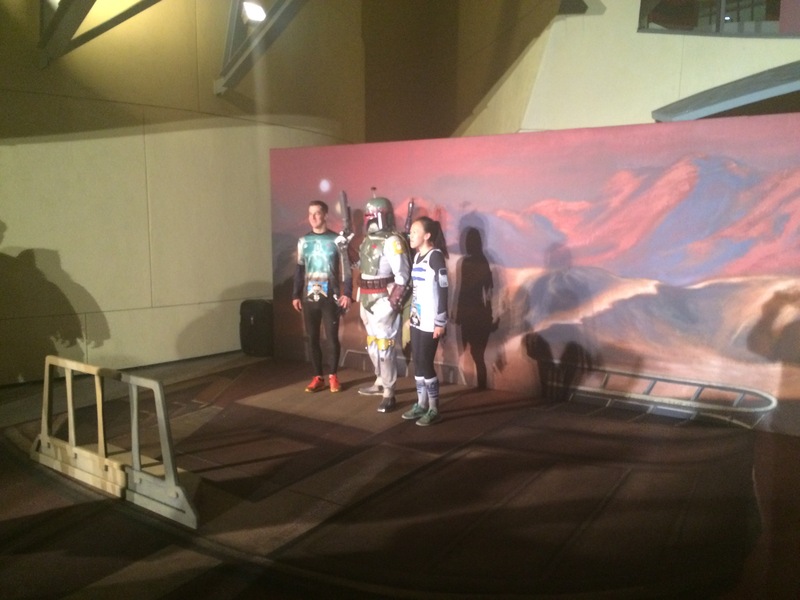 I arrived in plenty of time to take part in the Disney Cast Member pre-race photo! Sorry, I don’t have the pic on that one. However, it was cool to be at the race early enough for the Cast photo! After wandering around for a little bit, I headed off to my corral. For the very first time, I was in corral B!!!!! The pre-race banter was a little more entertaining. I’m not sure who this guy was. 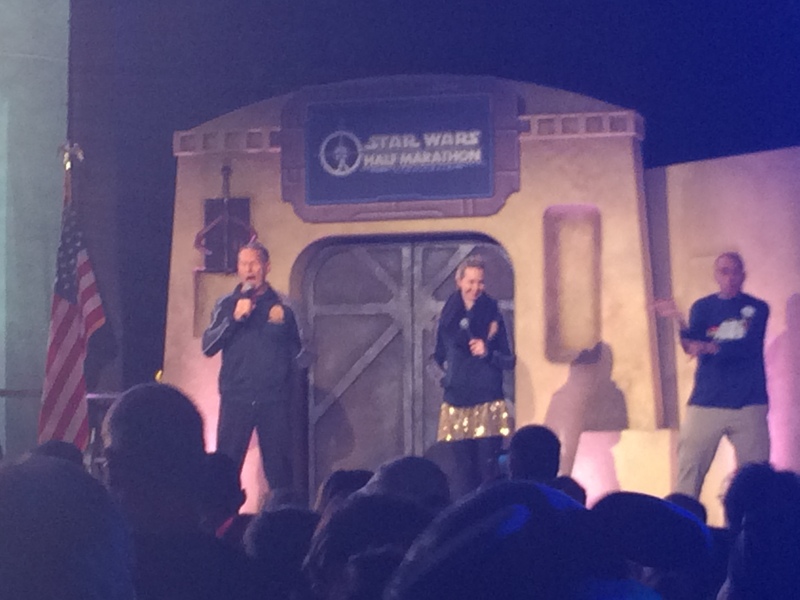 However, he was doing this beat-box singing the Star Wars theme song kind of thing that was fun. 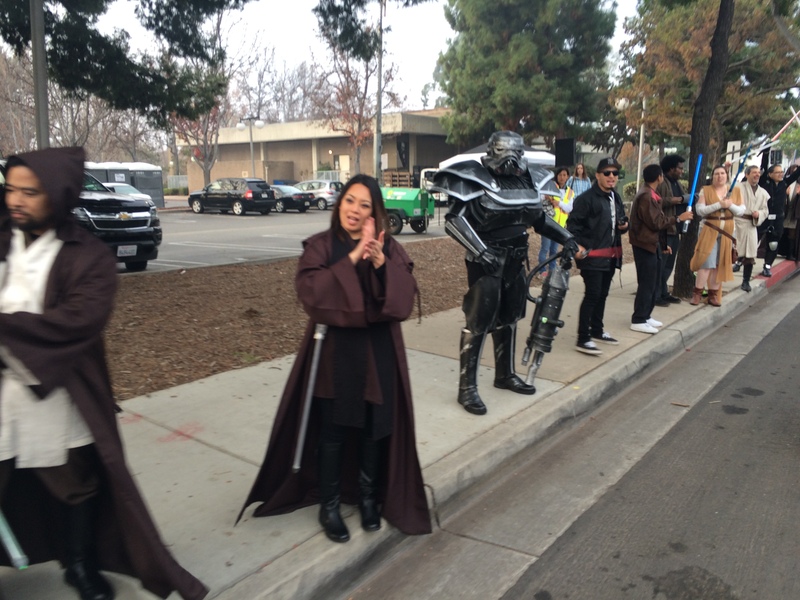 Then, Rudy and Carissa were warned that some First Order Storm Troopers were out and about. So, they left the stage while these guys took their spot. They were mildly entertaining. After corral A took off, it was our turn to make our way to the start line! I took off my throw away as we moved forward. I knew my time was coming. And we were off! 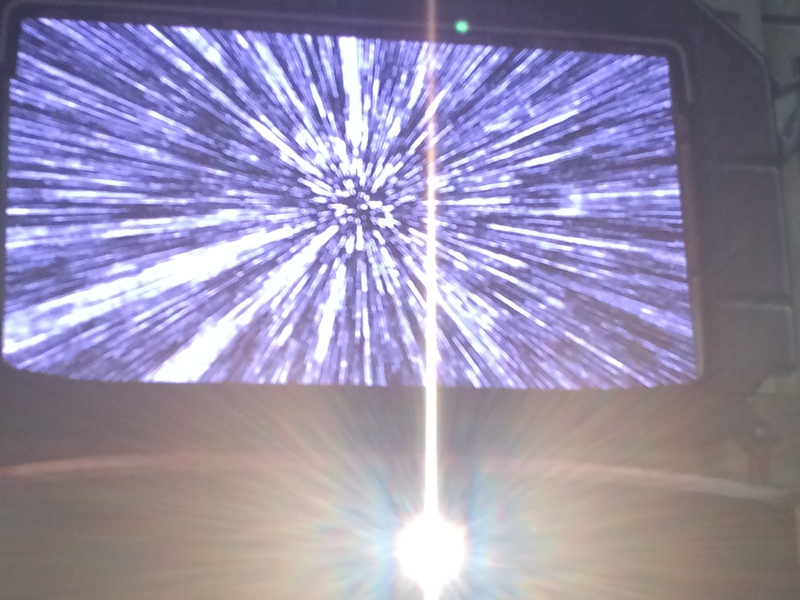 As I saw this, I couldn’t help but wonder how amazing it would be if I were able to run at light speed. 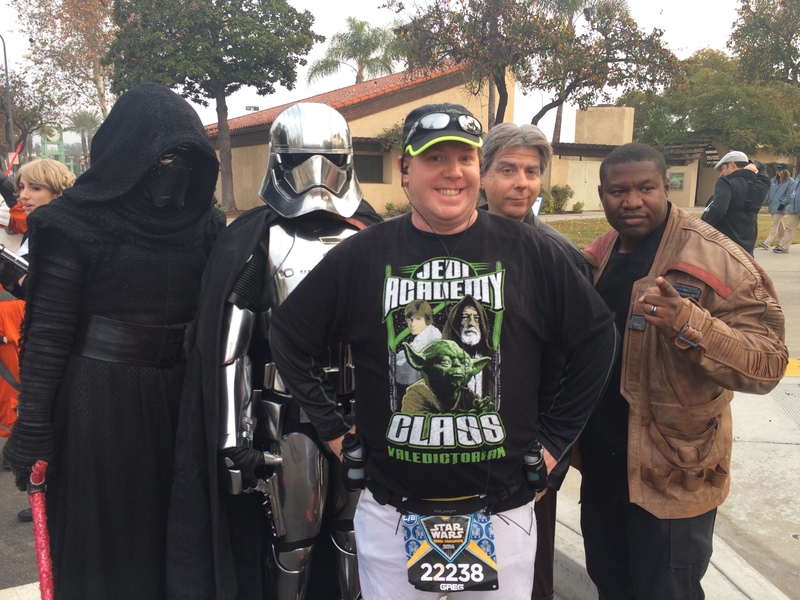 The start of this course was exactly the same as the start to the Star Wars 10K the day before. 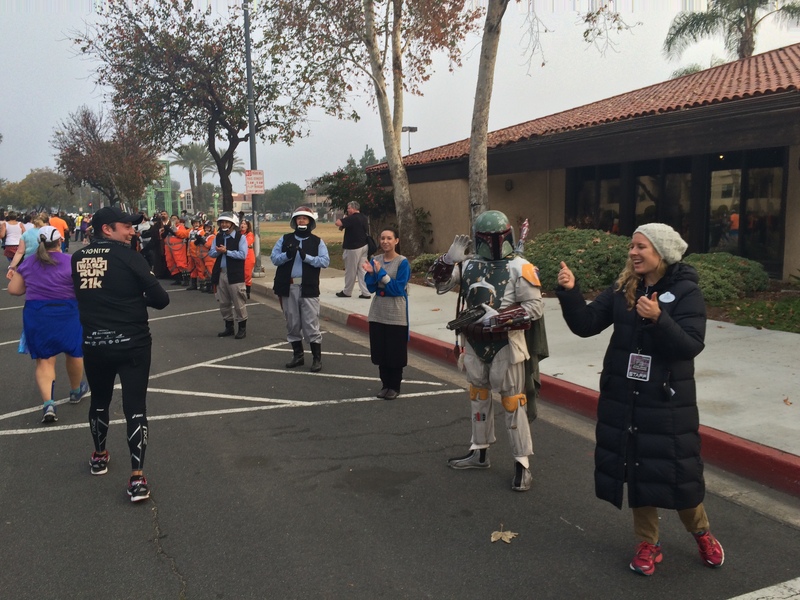 The plan going into this race was to run 30 seconds, walk 90 seconds with only quick stops for pics until we came to the 501st Legion. 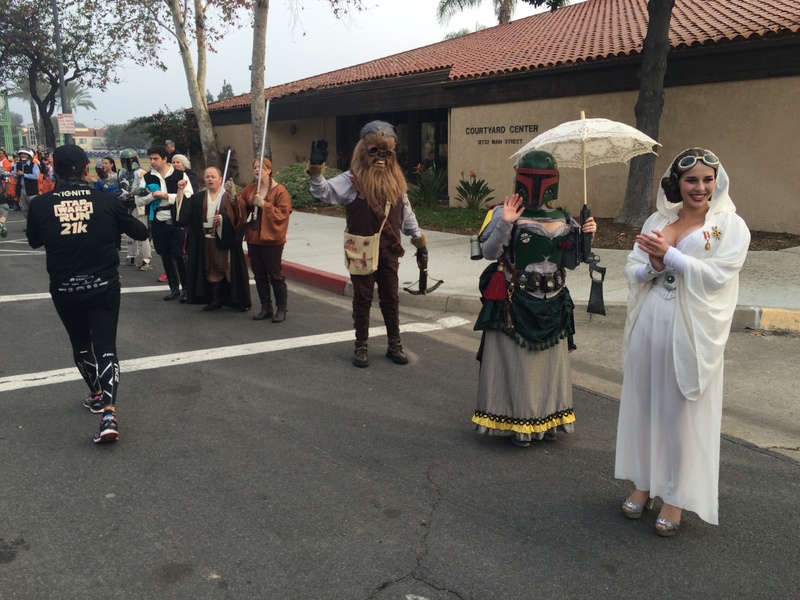 If you look, you’ll see that the line for Boba Fett was just as long as it was the day before. With the line just as long, I kept on going. I was kind of bummed that, even in corral B, I came to long lines again. 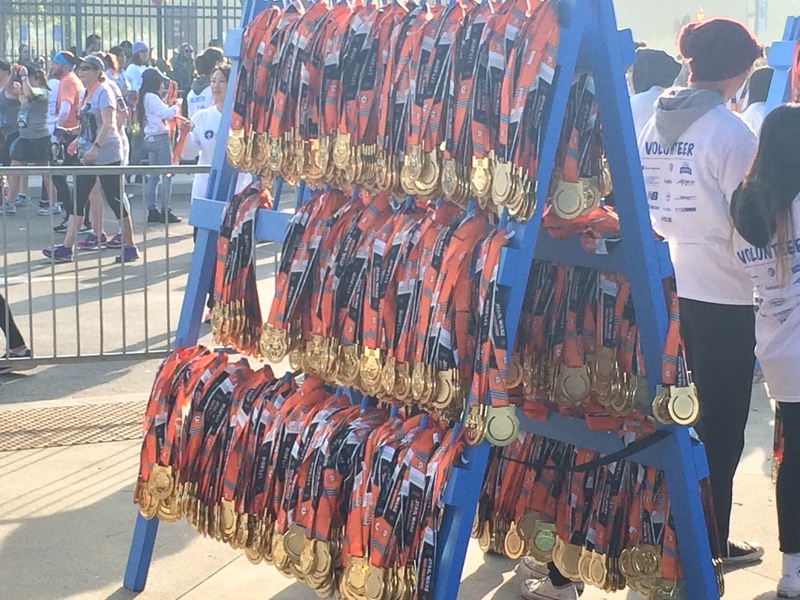 The crowding on the race course wasn’t as bad as on the 10K. The route was different once we got past the 1 mile marker. According to my splits, I actually finished the first mile 10 seconds quicker than the day before! Mile 2 is where the course started going different from not only the day before, but the year before. We didn’t go through the tunnel that connects backstage Disneyland and DCA. 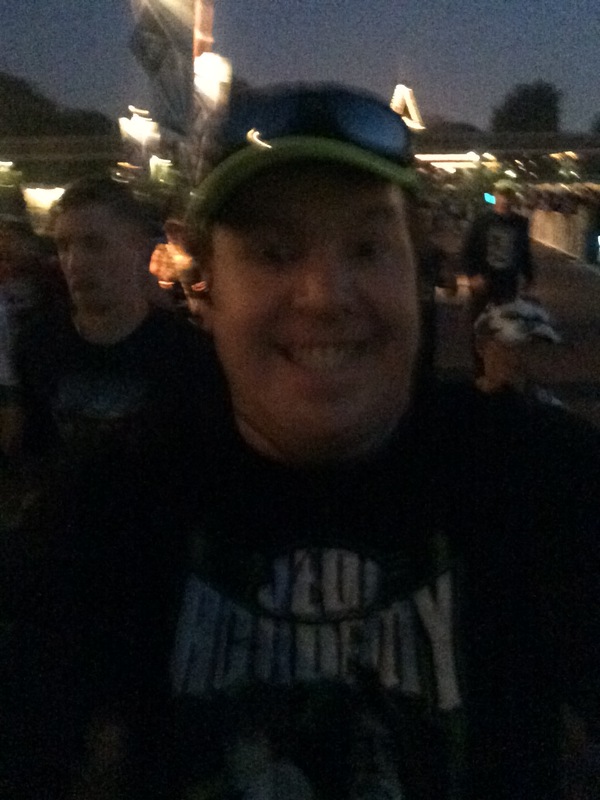 Instead, we headed down a narrow backstage area to bring us to the front of Disneyland. 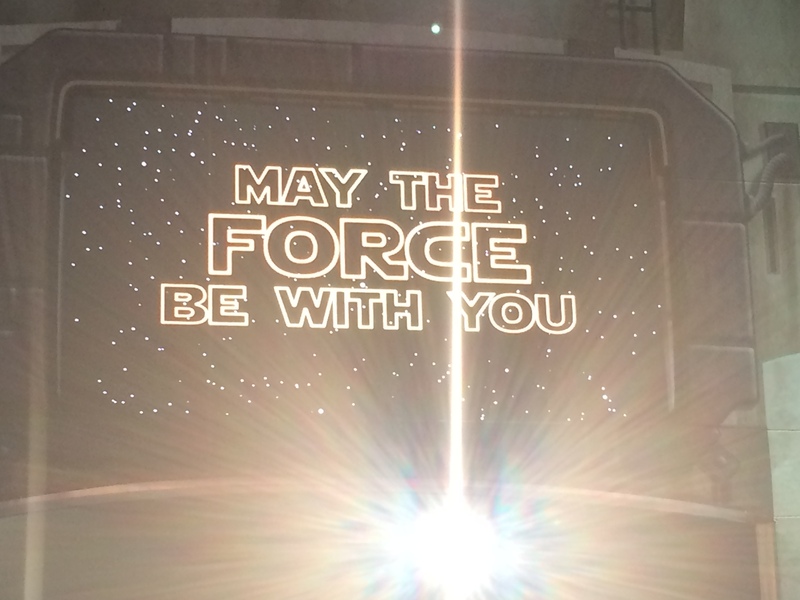 It was a really quick jaunt from the backstage area to going inside of Disneyland. While the 10K took us from backstage DCA to this entrance to Disneyland, once we got inside, the route took the same turns as the day before. 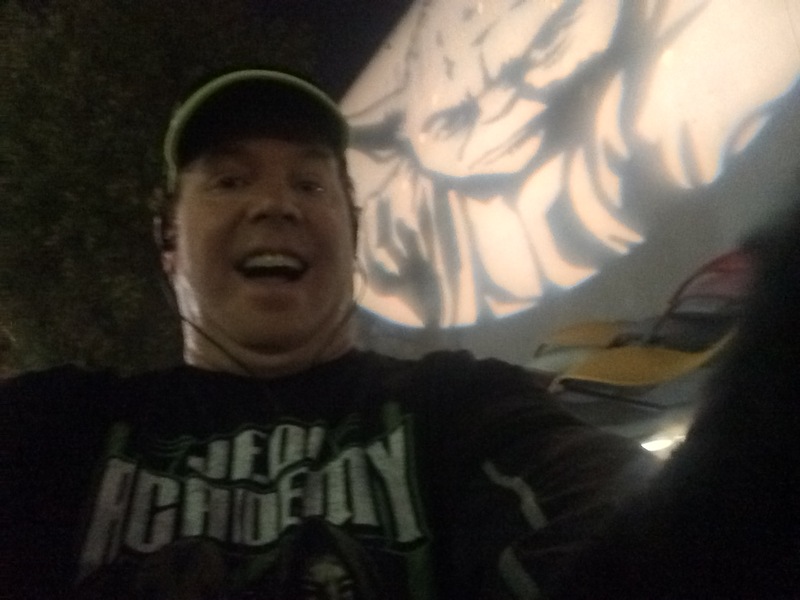 We passed by Yoda again in the same location. I couldn’t remember if I got a good selfie the day before. So, I took one again. Ha! We made our way onstage at Tomorroland again. 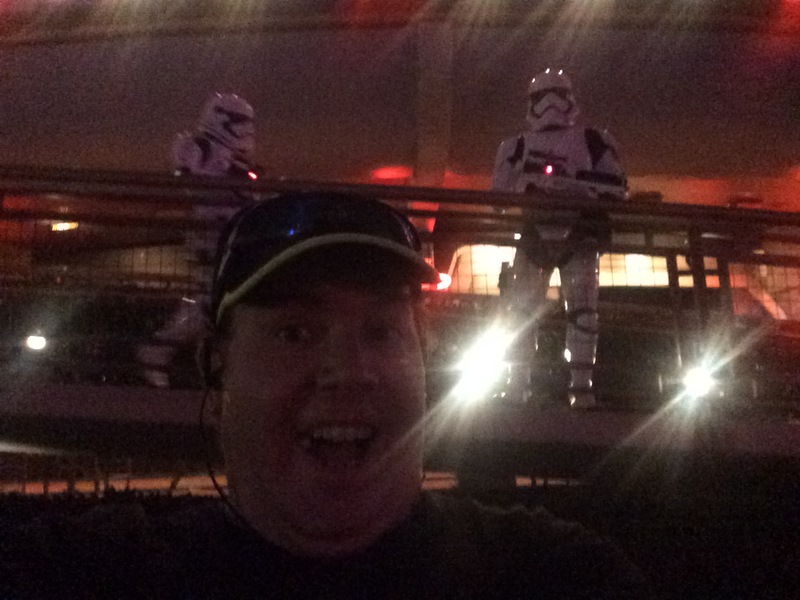 This time, there were some First Order troops wandering around the Star Wars Launch Bay. 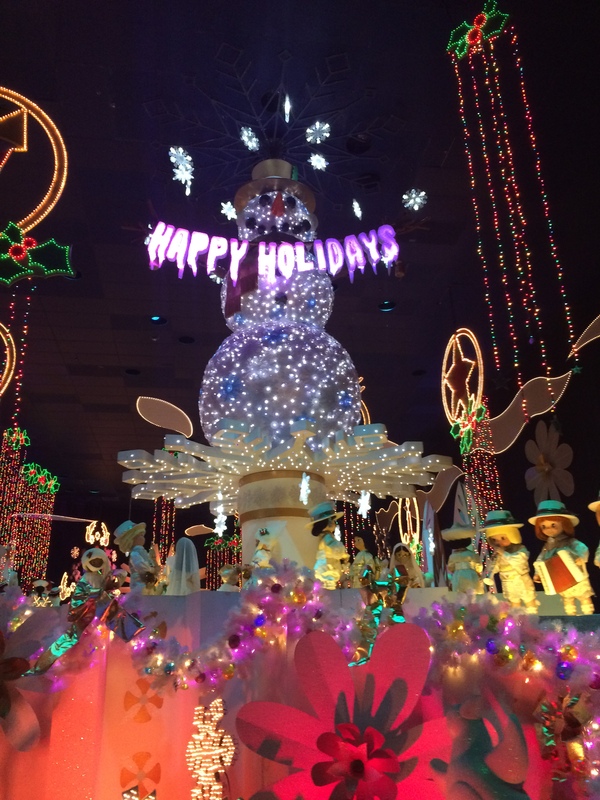 making our way up towards It’s A Small World Holiday. 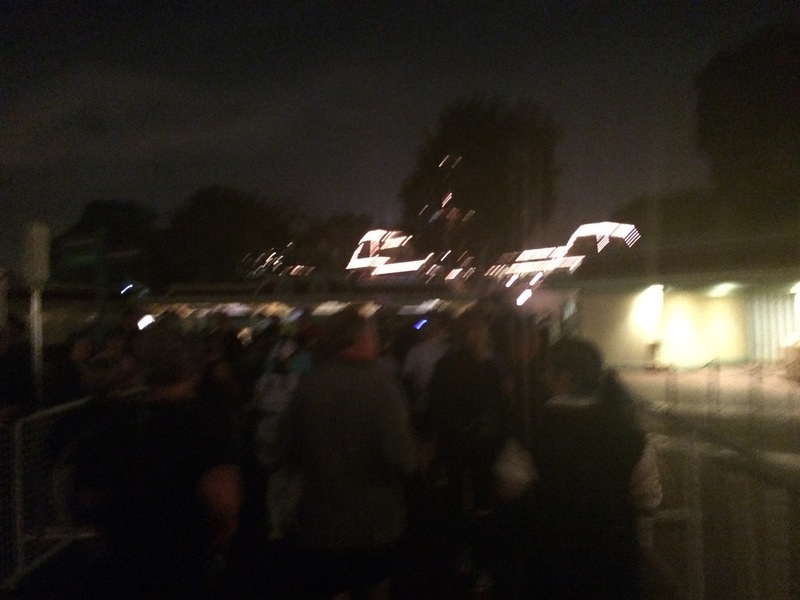 Part of what makes running through this area is the lights leading up to It’s A Small World. 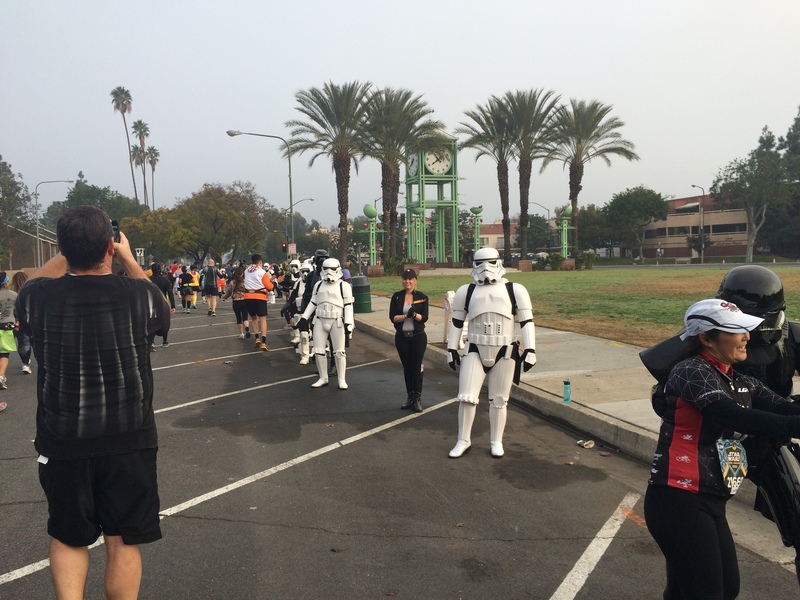 During the 10K, I regretted not getting a pic in this area. 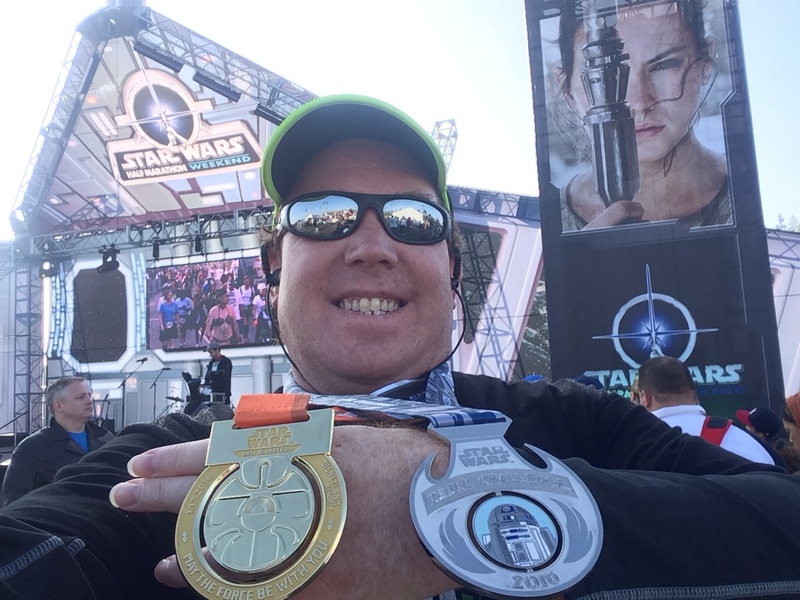 So, I made up for it at the half marathon. Of course, I did have to stop for a pic with It’s A Small World Holiday again. The sight of It’s A Small World all lit up never gets old! We followed the same path from It’s A Small World as we did the day before. Back through the tunnel! Then, it was off to the Big Thunder Trail…wrapping around the Rivers of America and turning up and over the bridge by Pirates of the Caribbean on our way through Adventureland again. So, while I can’t remember running through Adventureland before this weekend, I had now run it twice. 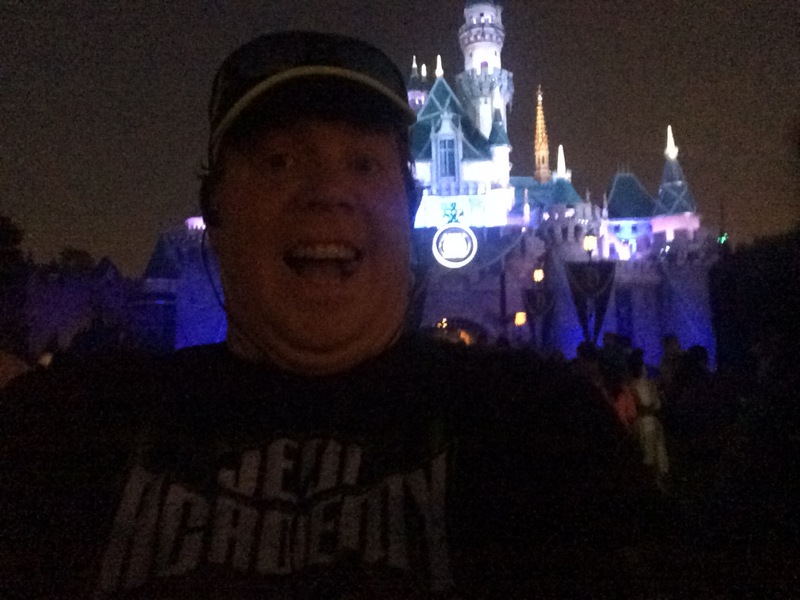 This time, when we left Adventureland, we turned up to run through Sleeping Beauty’s Castle. We went up through Fantasyland….turned right at Dumbo and by the Tea Cups. We continued through the parade route all the way back to Main Street U.S.A.
Running up Main Street U.S.A. never gets old! 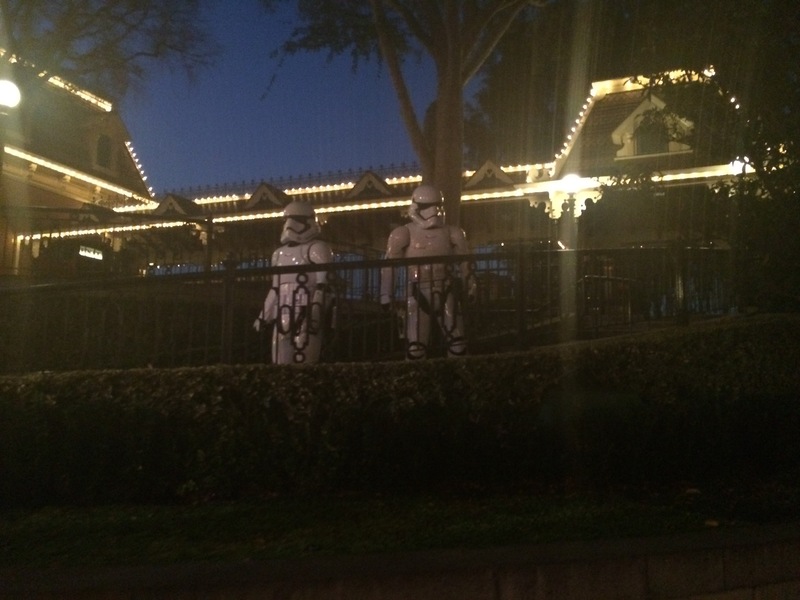 Just like the day before, we had some First Order troops at the Train Station. 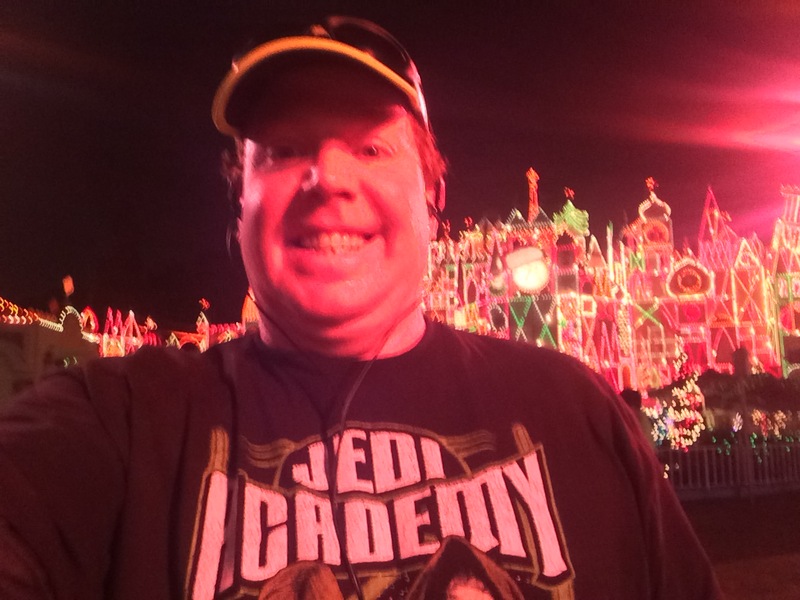 Then, it was time to head out of Disneyland and onto the Esplanade. I do love this part of the race because there are always so many people out to cheer us on in this part of the course. 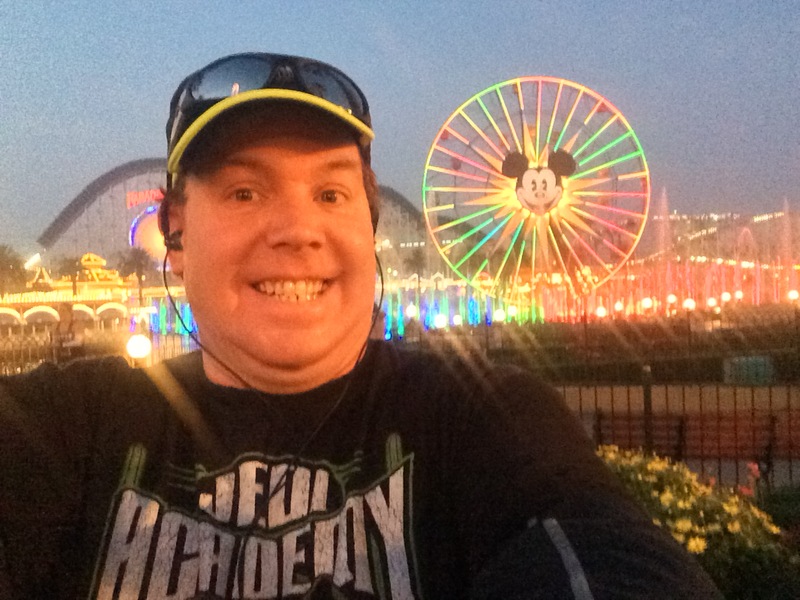 I actually ran all the way to we were almost in DCA. Then, I stopped to grab a quick pic. Hello Buena Vista Street! 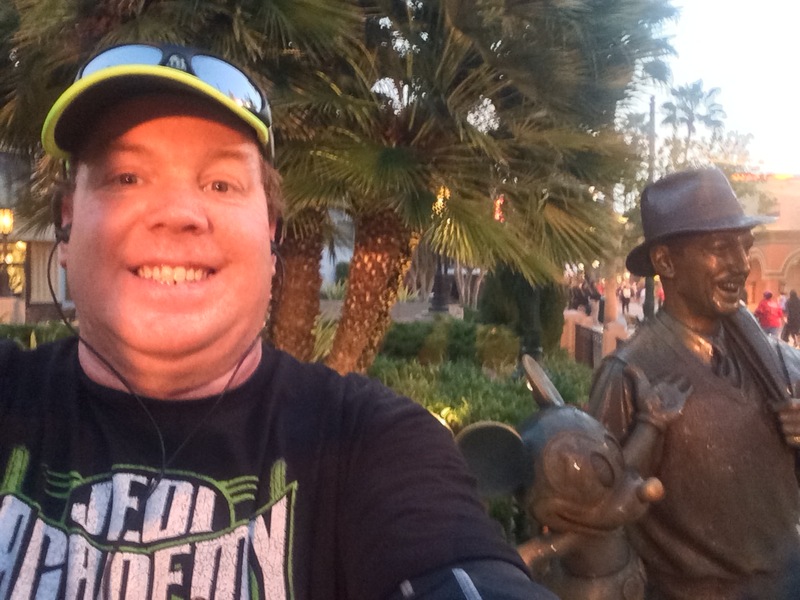 For the 10K, we went left at the end of Buena Vista Street. 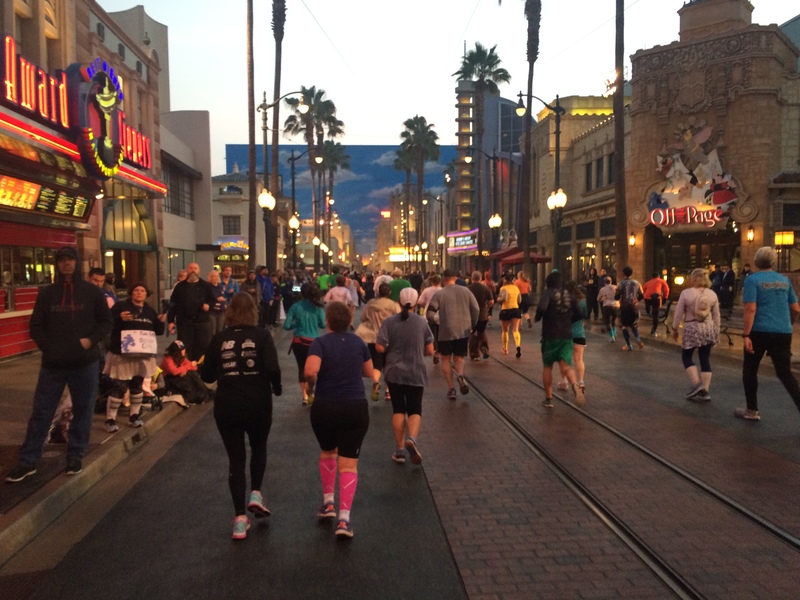 For the half marathon, we turned towards the Condor Flatts area and by Soarin’ Over California. Just past Soarin’ Over California, I broke my “no stops in the theme parks” rule. 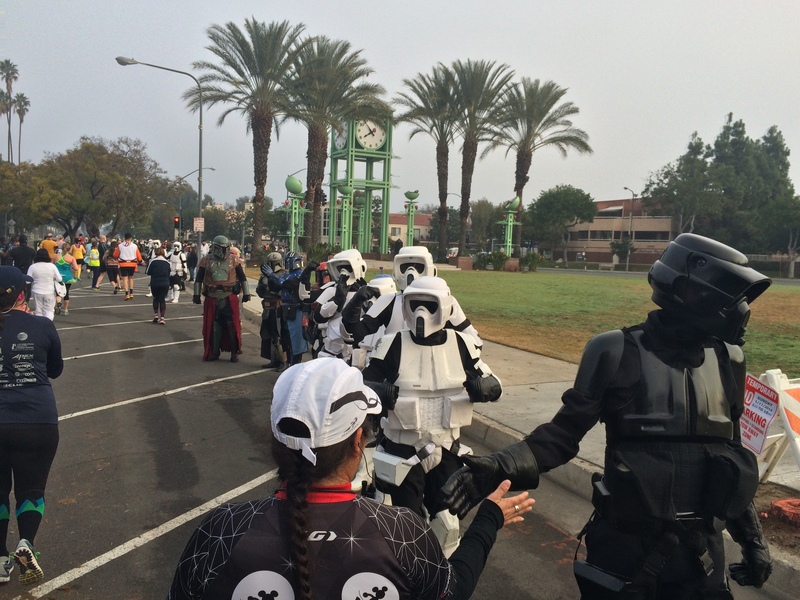 When I saw the speeder bikes at the end of the 10K, I regretted not stopping. Since the line didn’t look horribly long, I hopped in. 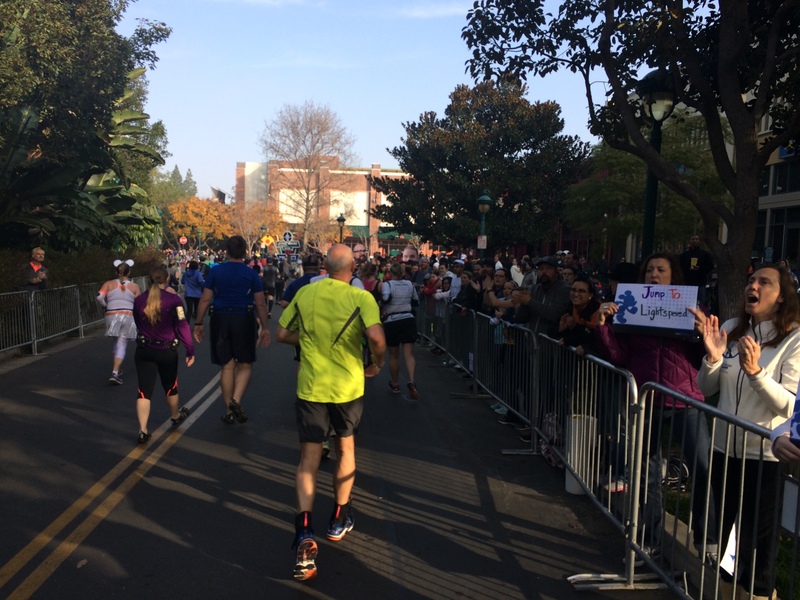 As I stood waiting my turn, I knew my shot at a sub 3 hour half marathon were probably gone. I was totally okay with that. How cool is this pic? One thing I want to mention here. The ground we ran on in the theme parks was pretty slick. I was a little concerned about slipping the whole time I was in the parks. 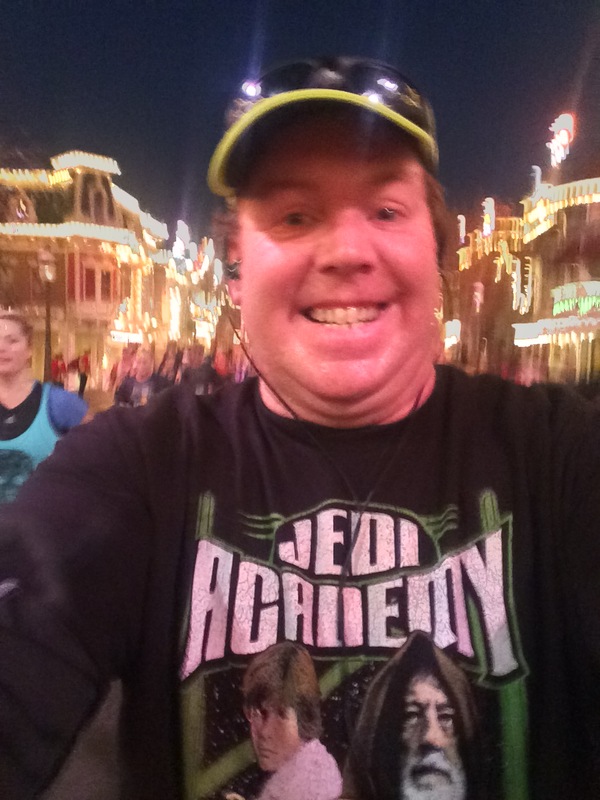 So, I was a little slower in the parks than I might have been otherwise. It was okay because this race was for fun. The route continued through the Grizzly Peak area and onto Paradise Pier. Since we got here earlier than the day before, the World of Color fountains looked so amazing! Seriously cool! We went up towards Ariel’s Grotto and then to California Screamin’. The ground was slick. So, I was cautious as we went around the pier. One thing that was a bummer is that Mr. Potato Head was not out in front of Toy Story Midway Mania (like during the 10K). 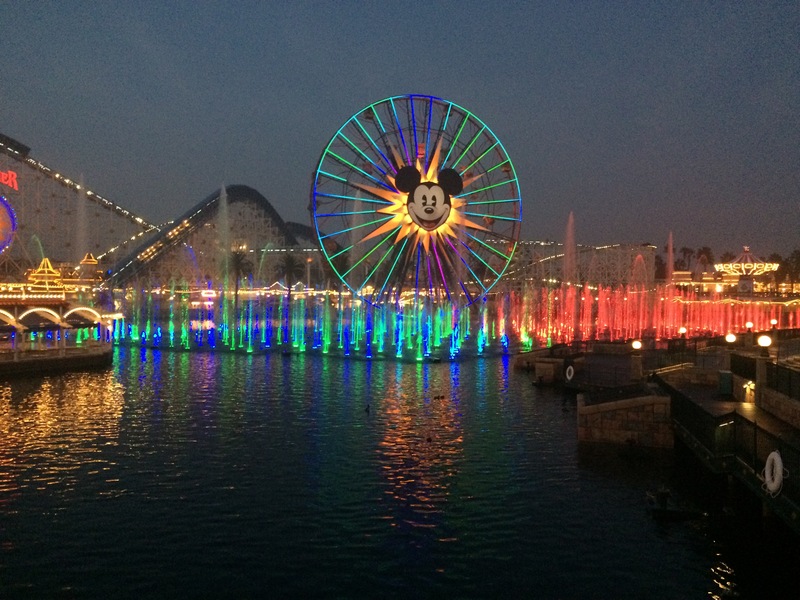 We turned backstage at DCA on the pier. 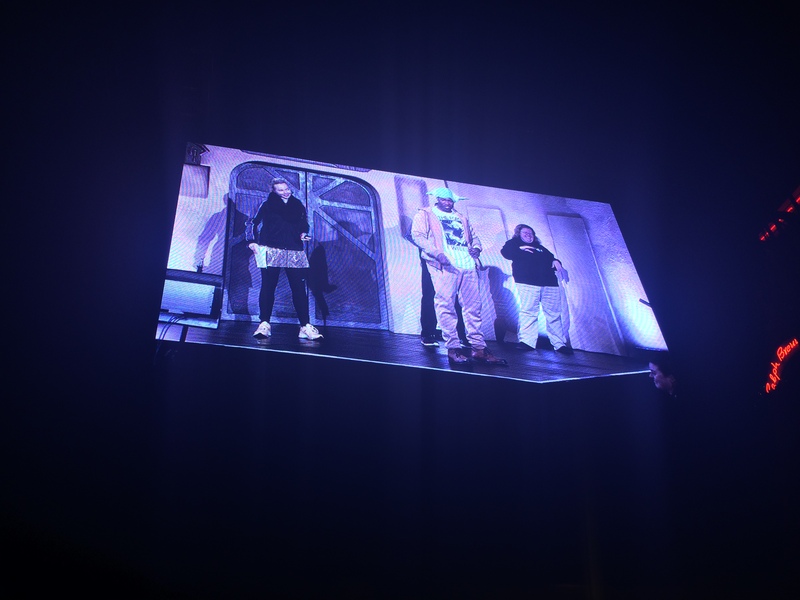 We came back onstage right by the Radiator Springs Racers again. Yes, I know that I stopped for a pic here on the 10K. But, I love this spot! 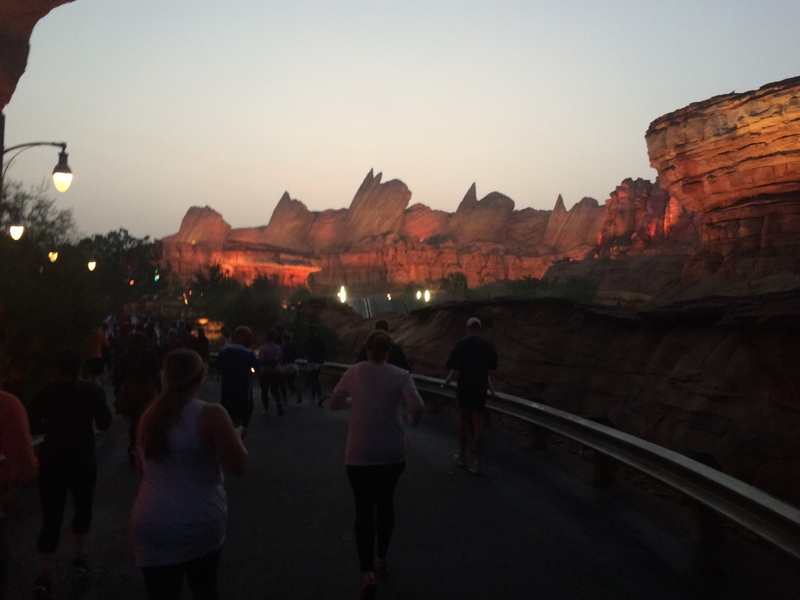 This time, we ran up Route 66 (aka Cars Land). 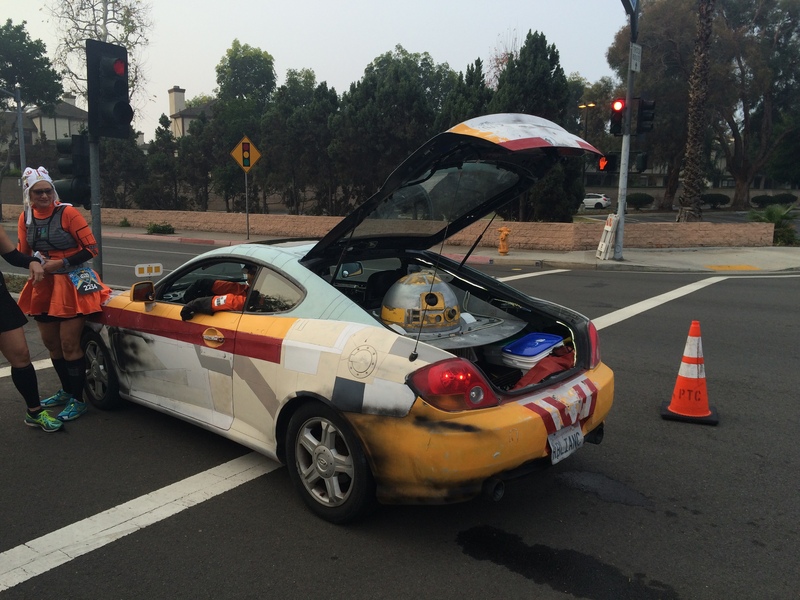 Just like the day before, 3-3PO and R2-D2 were at the other end of Route 66. I was on a run interval. So, I didn’t stop. We headed right and back towards Buena Vista Street. 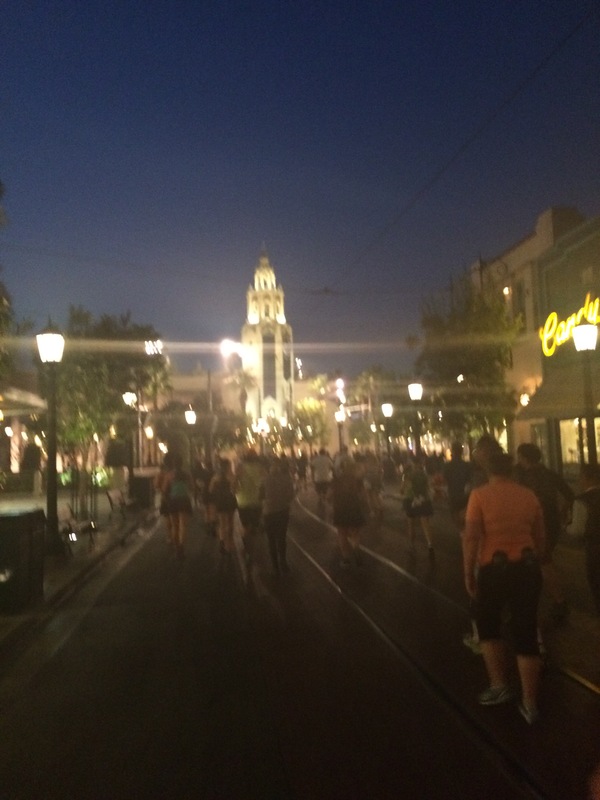 We turned at the Carthay Circle Restaurant to go up Hollywood Land. I stopped for a quick pic with the Storyteller’s Statue. It would have been good to be running with a friend here who could have taken my pic. Oh well. 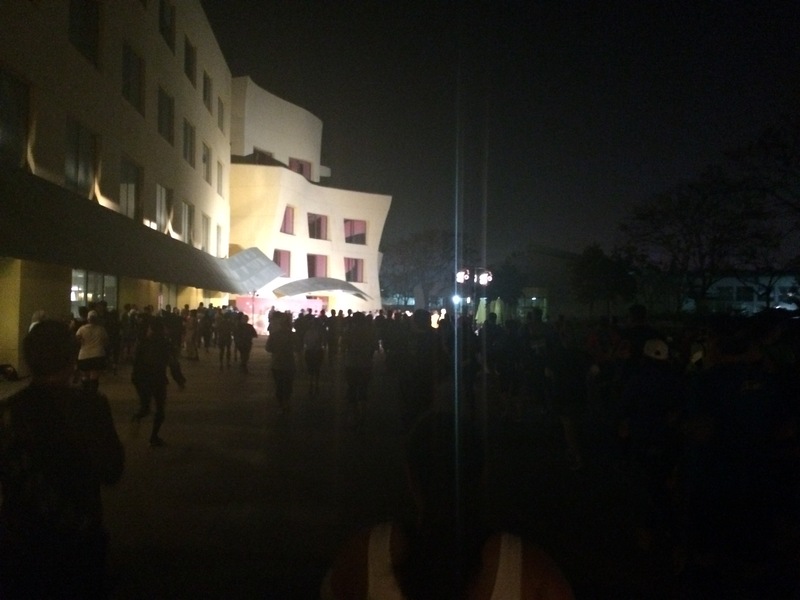 As we ran up Hollywood Land, it looks like this was the ChEAR Squad area for this race. Lots of people out and cheering us on. 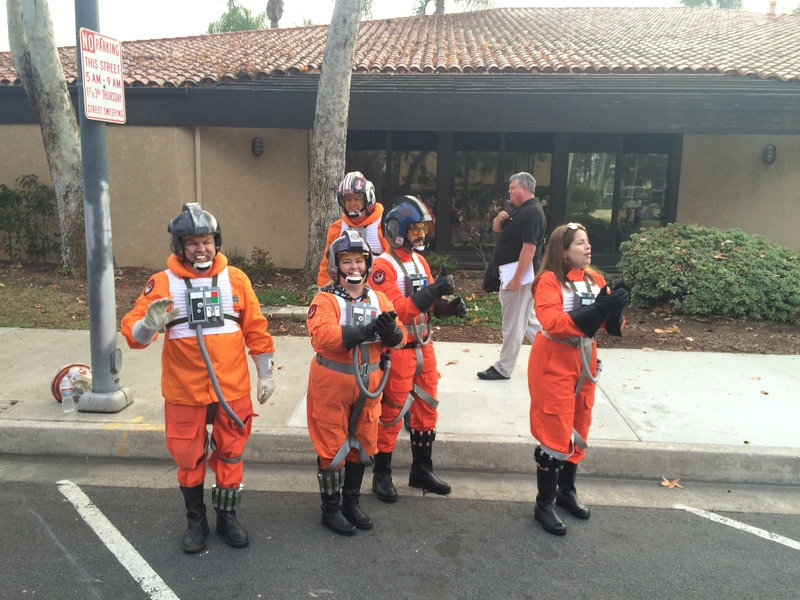 I could see that the line for BB-8 was long yet again. So, it was time for another selfie! 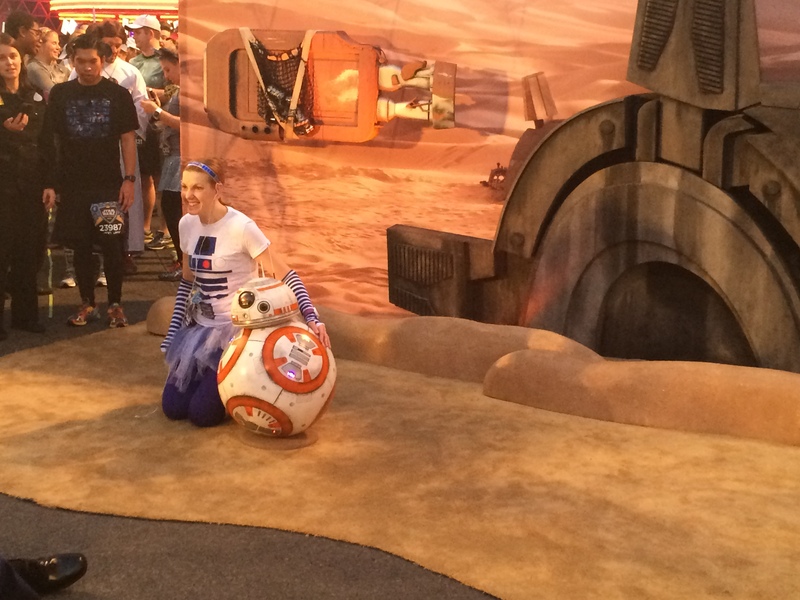 It would have been cool to get a pic with BB-8. Maybe next year. As I was taking this pic, I was thinking about how much I want to improve my speed to get into corral A next year. The course headed back towards the Tower of Terror and out of the theme parks. My time was seriously slow. That’s what I get for stopping. As I started running on the streets of Anaheim, it was time to change my focus. For the next several miles, I wanted to hit each and every run interval. I did just that. 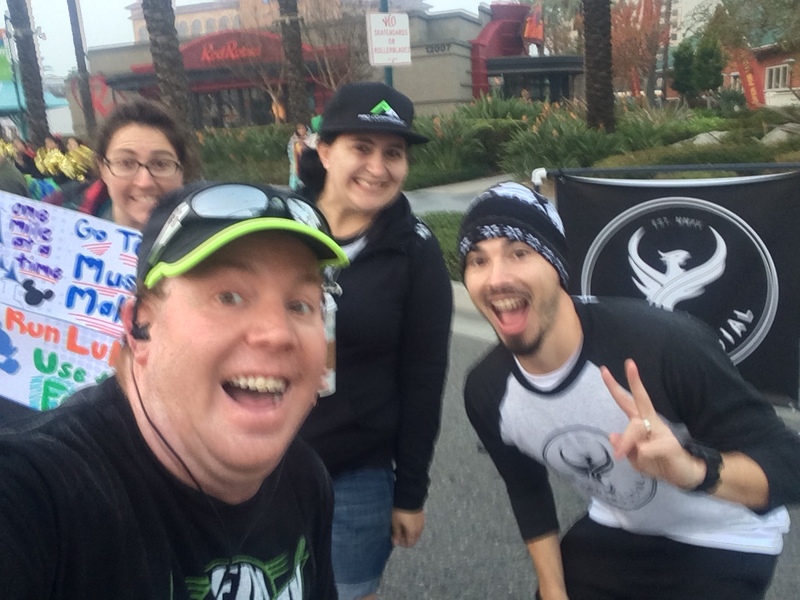 At the We Run Social Meet Up, Pavey said that he’d be somewhere in mile 5 or 6. So, all the way down Harbor Blvd., I was on the look out. Fortunately for me, I came to the end of a run interval right where the We Run Social crew was waiting. It’s always good to see people I know! After grabbing a quick selfie, it was time to continue on. Run 30 seconds, walk 90 seconds. On the streets, I got into a pretty good rhythm. 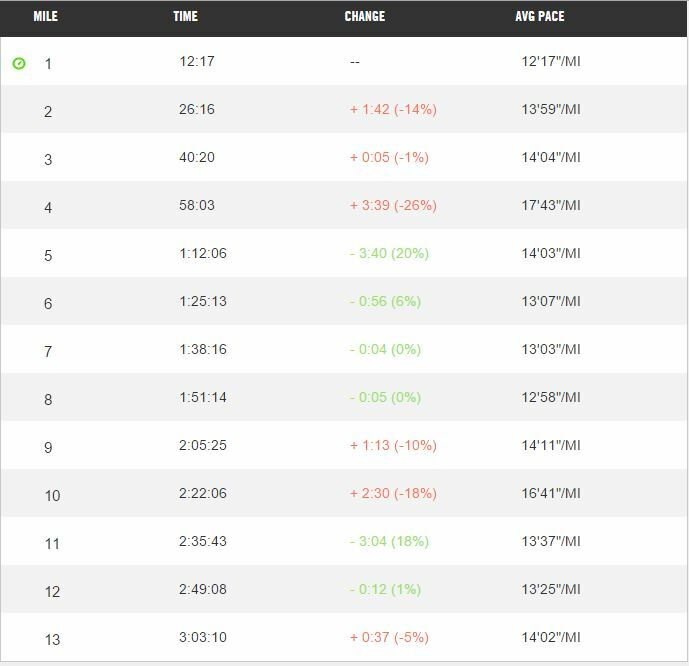 When you see my splits at the end of this recap, notice that miles 5, 6. 7, and 8 were good miles. I got faster in each of these miles. With nothing to grab my attention for pictures, I could focus on my running and fueling. Every 30 minutes, I’d take on a Cliff Shot Blok. I switched between water and Power Aid at the fueling stations. It was actually pretty cool! There was a couple people I kept using as pacers. I’d pass them on my run intervals. They’d pass me on the walk breaks. 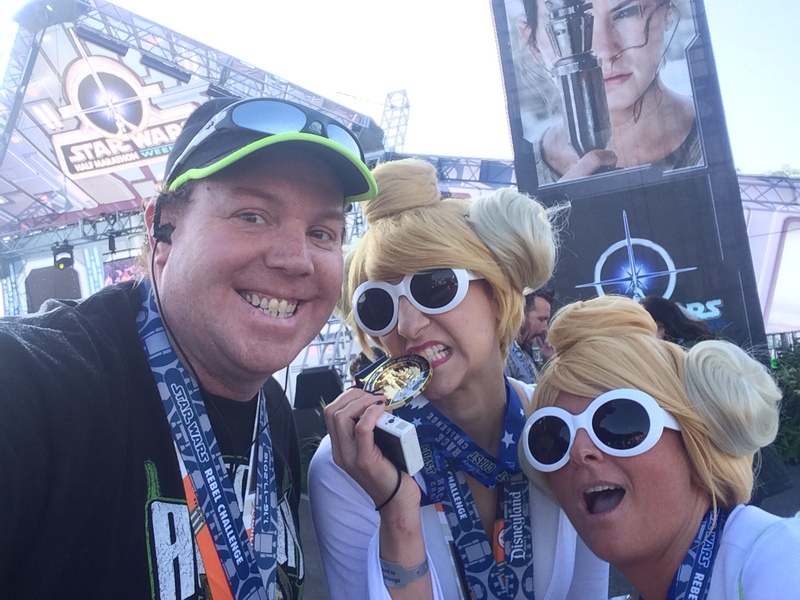 In mile 8, I saw my friends AJ and Ivie. So, for a little while, I ran with them. At the end of mile 8/start of mile 9, just like last year, the party started. First were the Cos Players. Lots of fun costumes to keep us entertained. 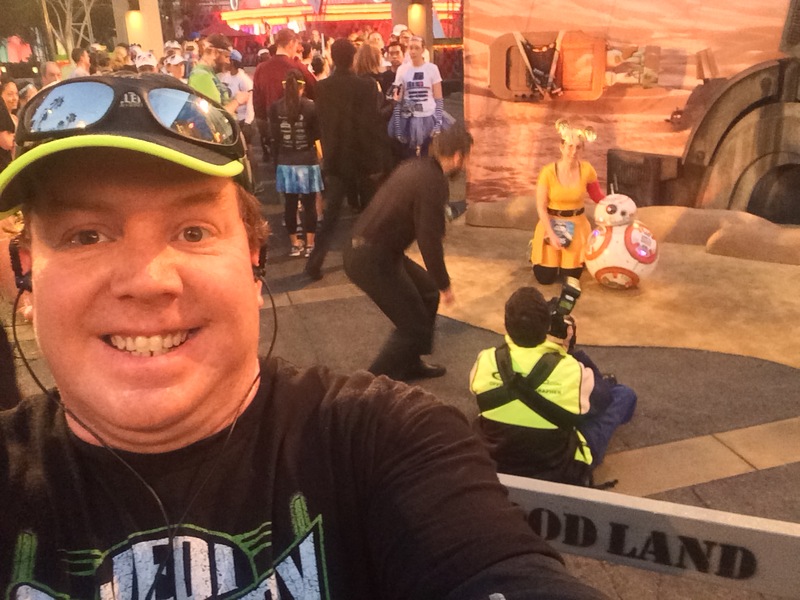 I got my BB-8 picture. Okay, it’s not as cool as in the parks. The person taking pics didn’t get a good one of me. This was the best one. Oh well. 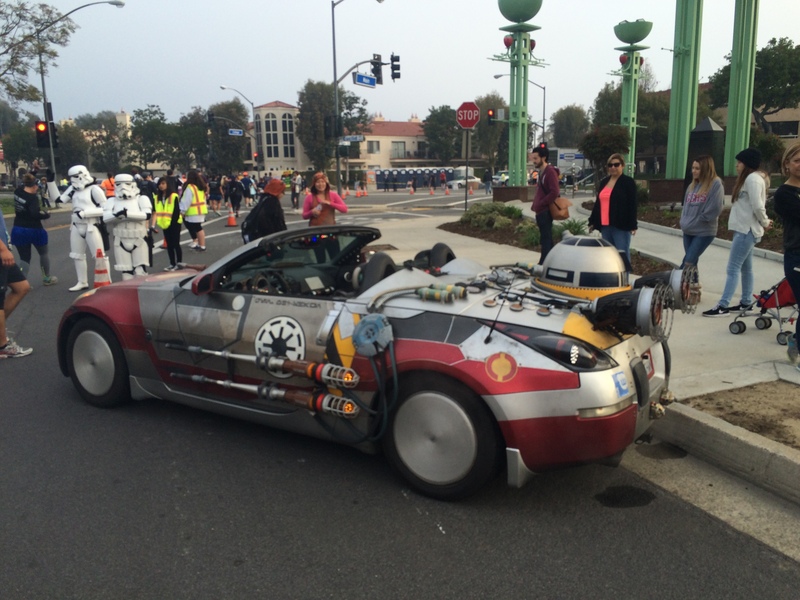 As we turned to go towards Main Street in Garden Grove, this cool car was on the course. It was the first of many. 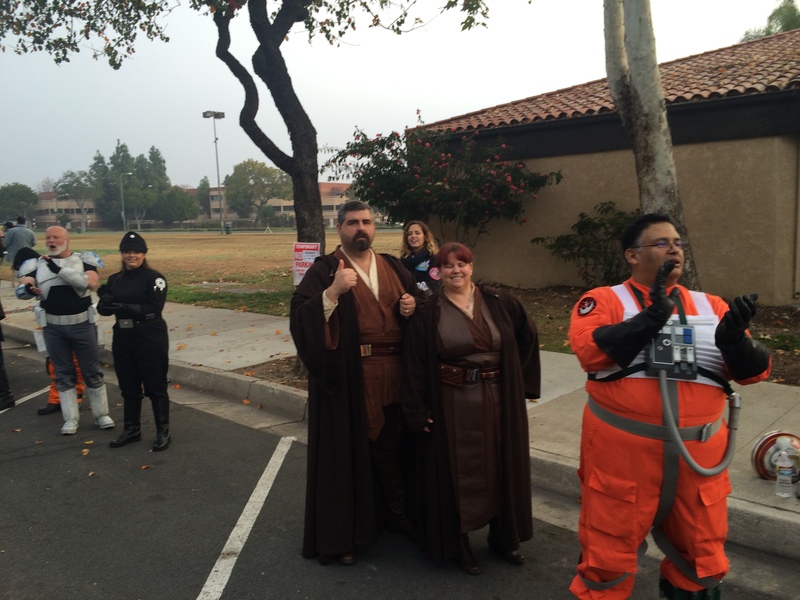 While I stopped for pics of the Cos Players and with BB-8, AJ and Ivie continued without stopping. I caught them on Main Street. However, this time, I stayed with my intervals instead of running theirs. 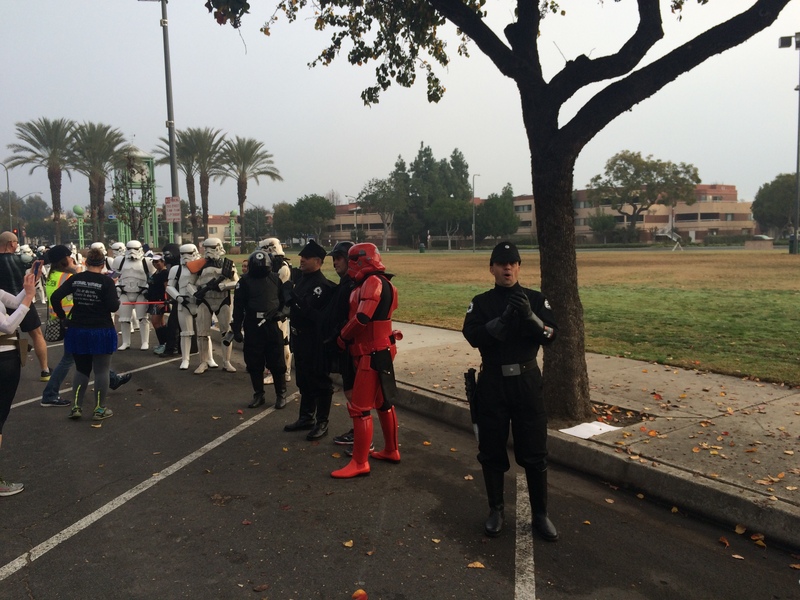 I didn’t know where the 501st Legion would start up. It all started with another cool car. See R2-D2? 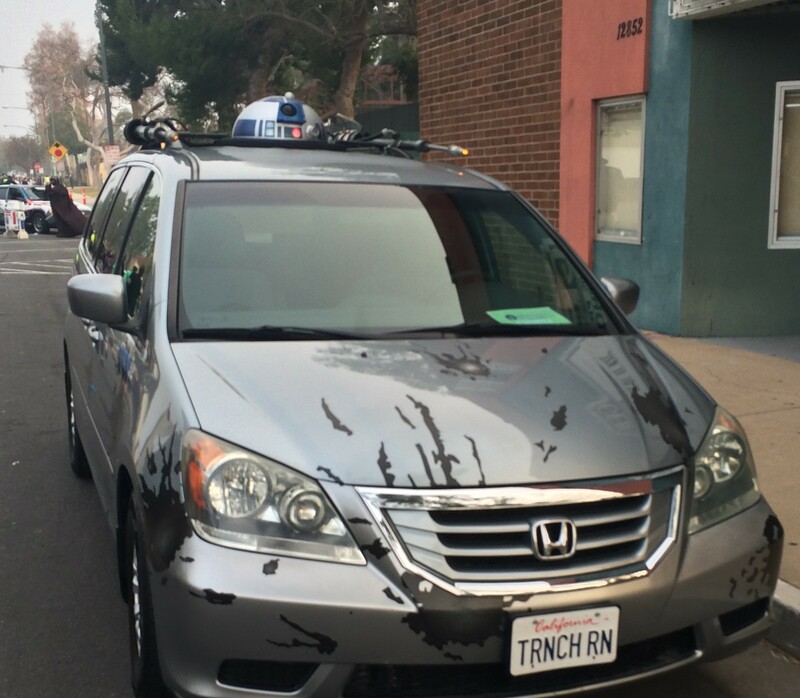 Another cool car, a droid, and Yoda! 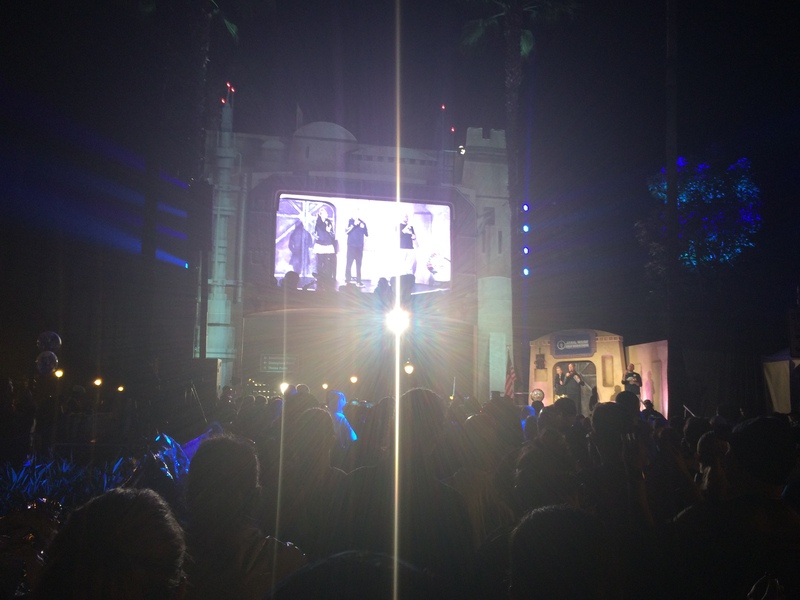 Then, I got in a small line for a photo with Kylo Ren, Captain Phasma, Old Han Solo, and Finn! I was only in line for about a minute or 2. So worth it! 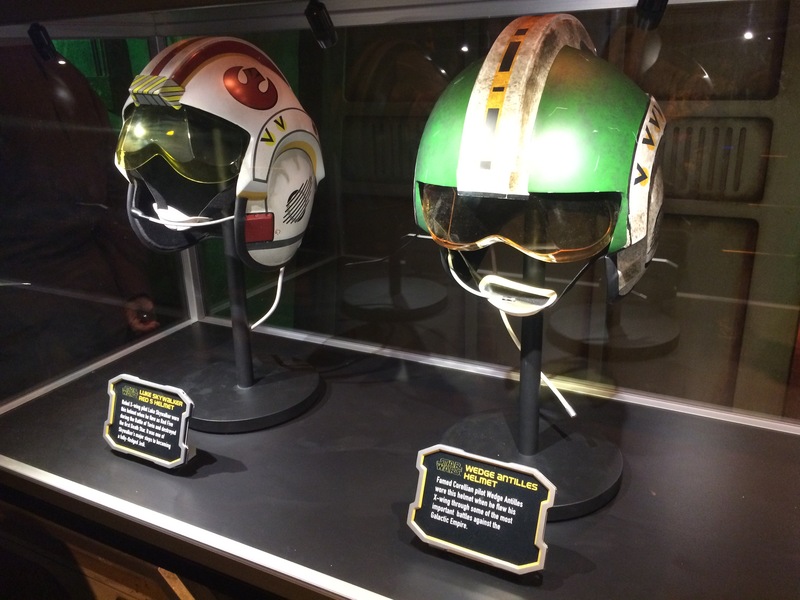 Right past these guys was not 1, but 2 R2-D2’s! Time for a quick selfie! 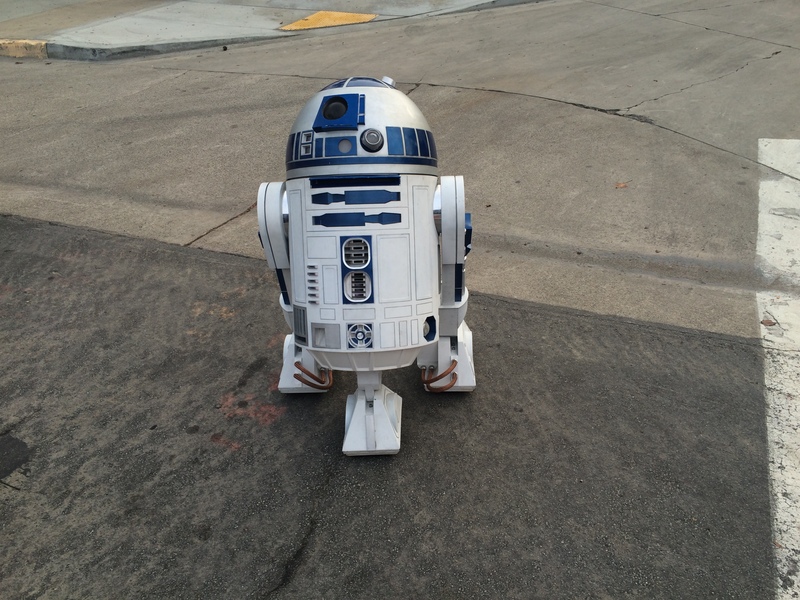 I may have missed a chance for an R2-D2 photo in the theme parks. But, I got one here with no wait! 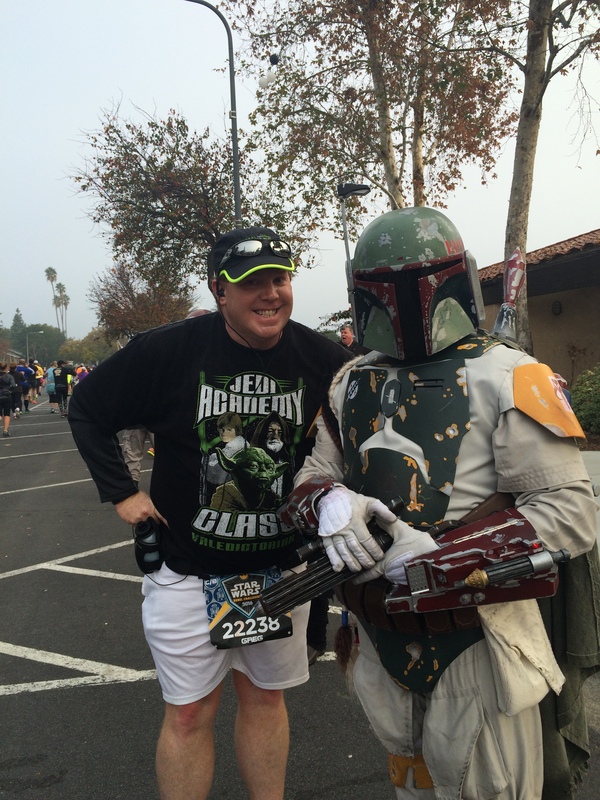 I had to stop for a photo with Boba Fett myself! Again, the lines in the theme parks were crazy long in mile 1. I had no wait for this one! 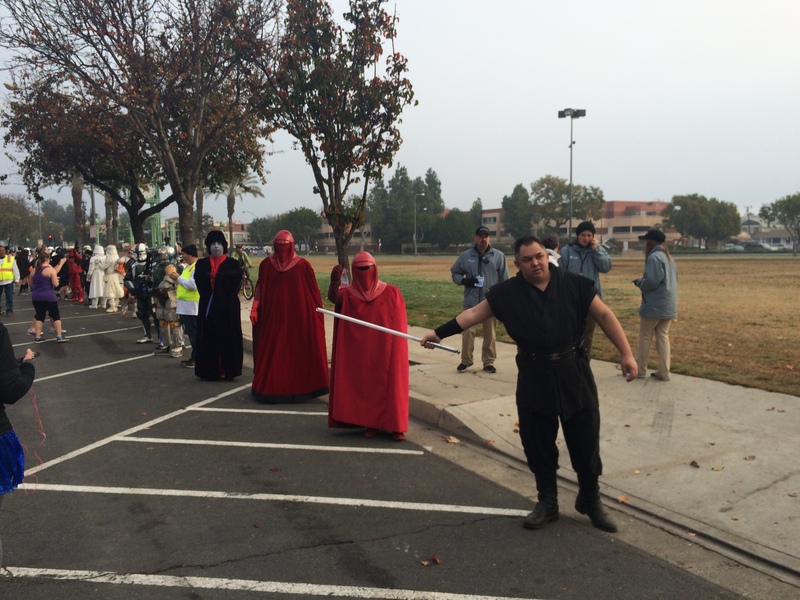 The Dark Side of the Force was well represented as well. 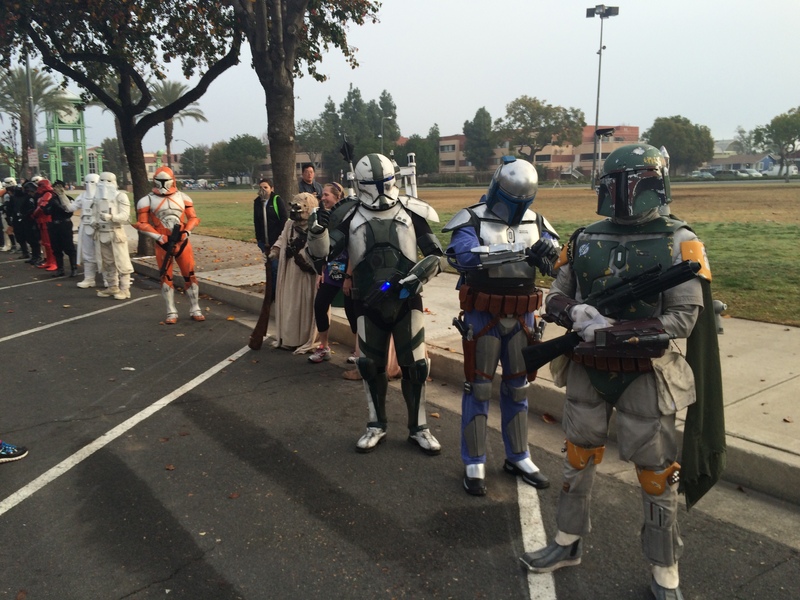 The Fett’s and Clone Troopers! 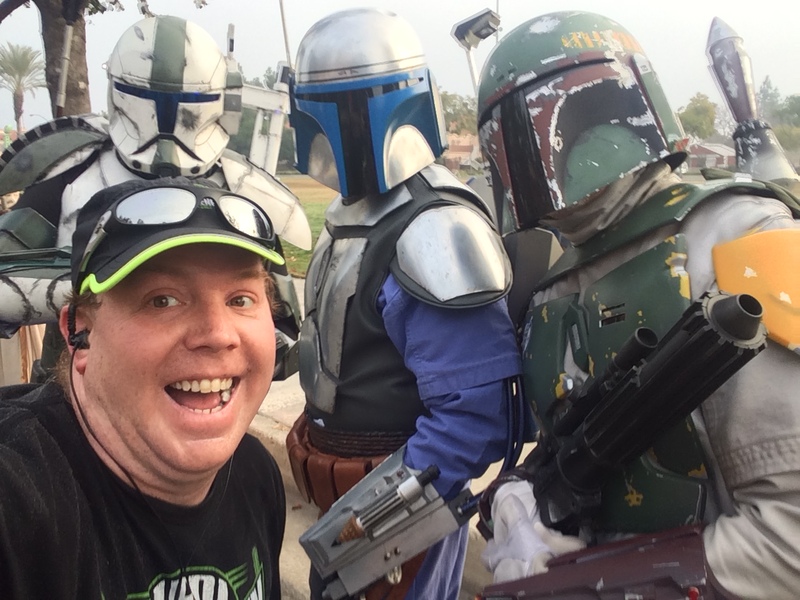 I had to stop for a photo with daddy and son…Jango and Boba Fett. 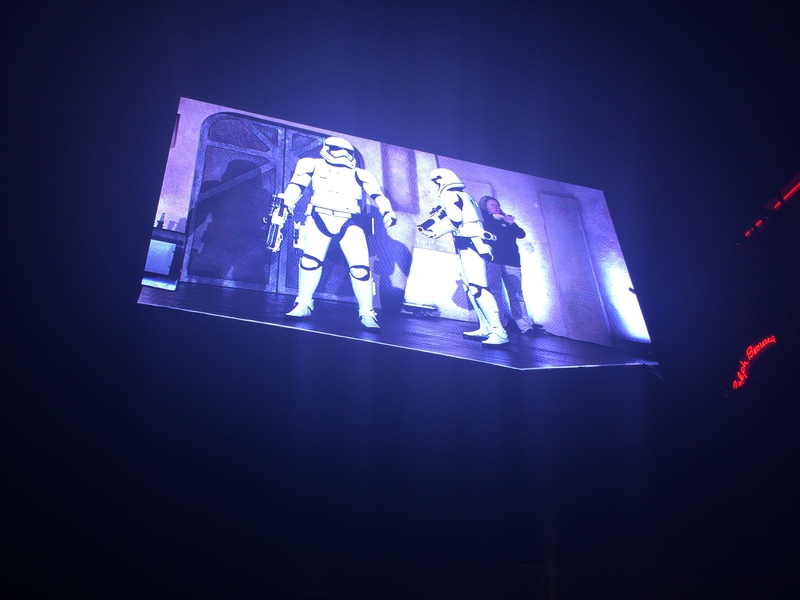 Oh, and a Clone Trooper. 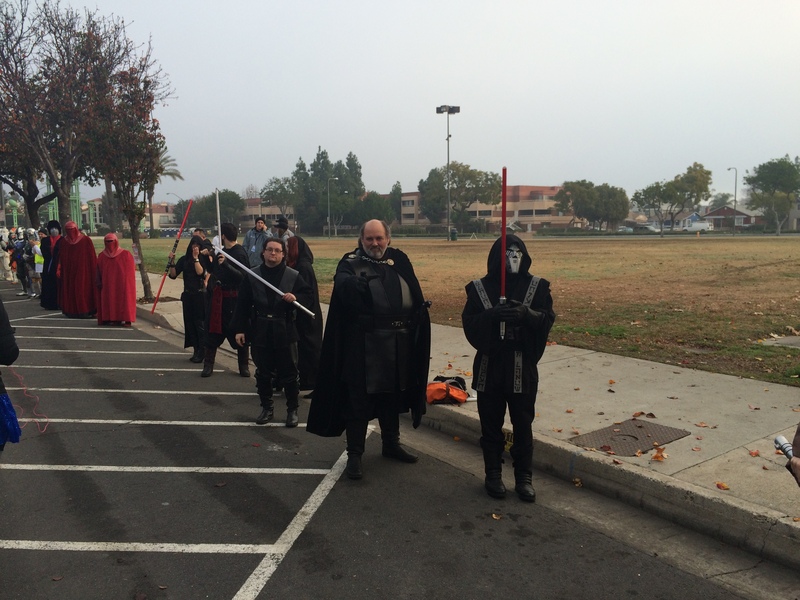 Uh, oh….more dark side peeps! 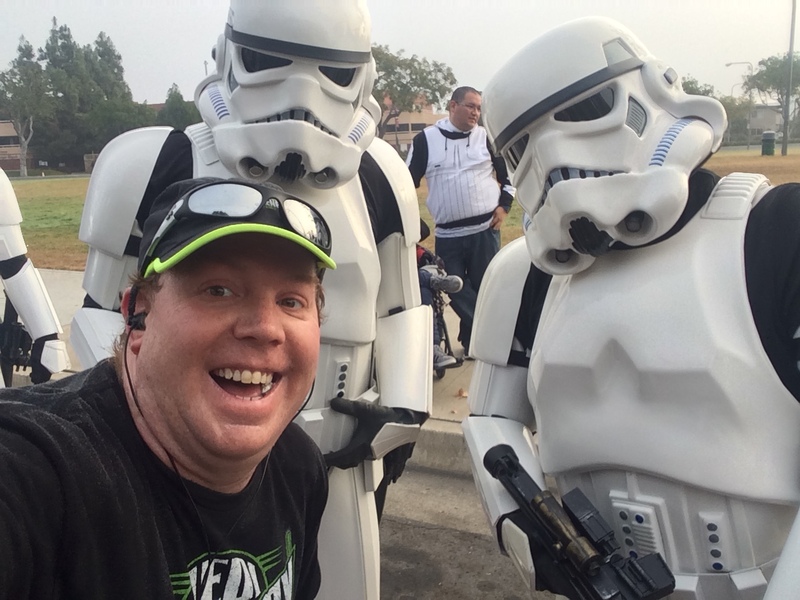 Time for a pic with old school Storm Troopers. 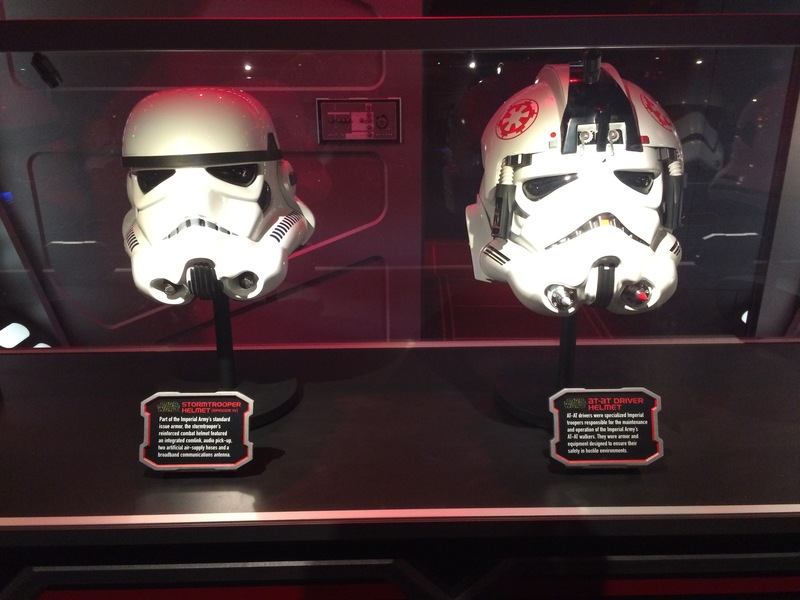 I always loved the Storm Troopers on Endor from Return of the Jedi! 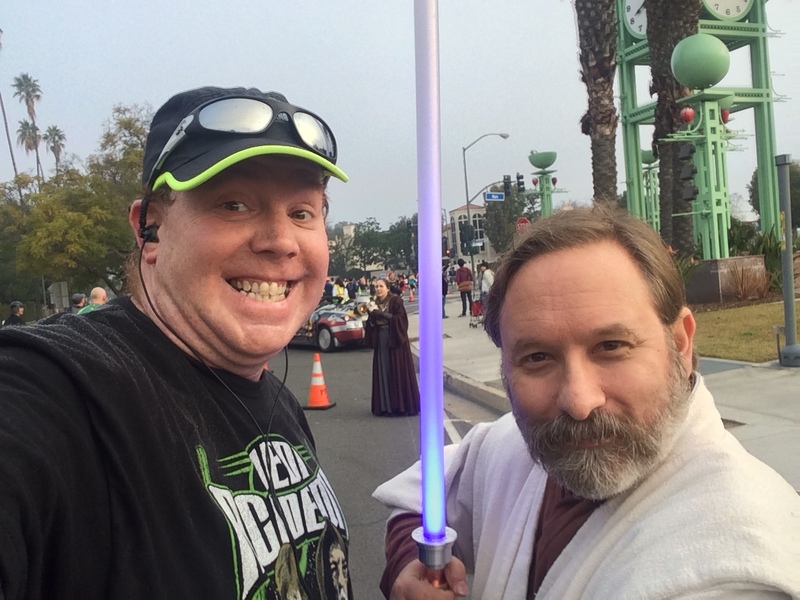 This Jedi, loved my shirt! 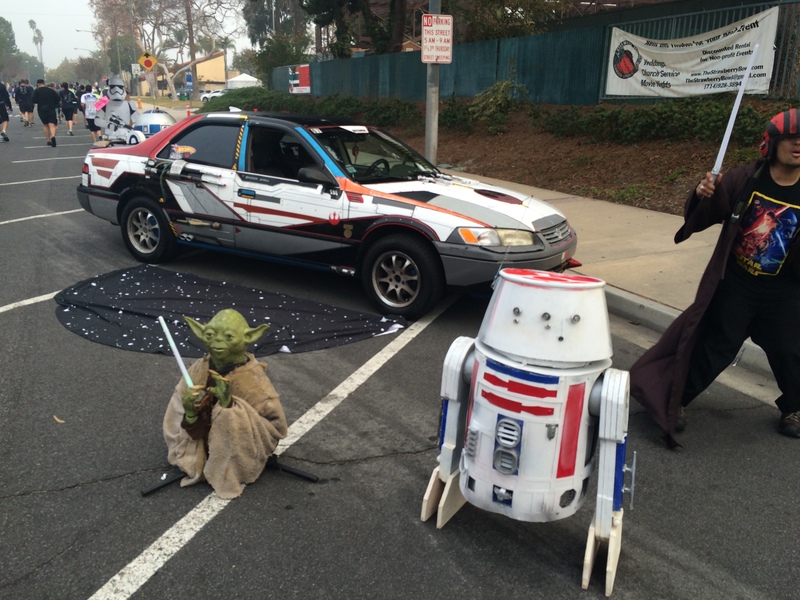 At the end of the row was another cool Star Wars themed car! 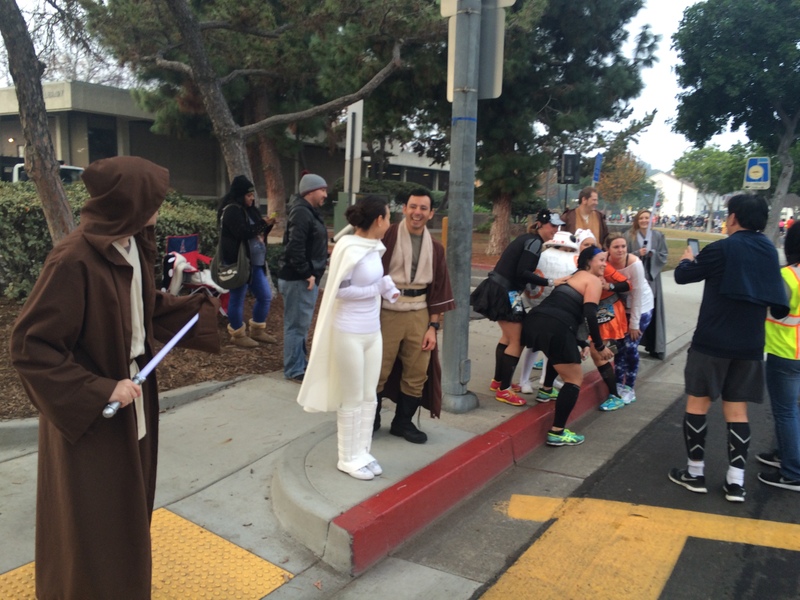 Just like last year, the 501st Legion gave me a huge boost in mile 10! Funny thing, miles 4 and 10 are where I made my stops. They are also my slowest miles. 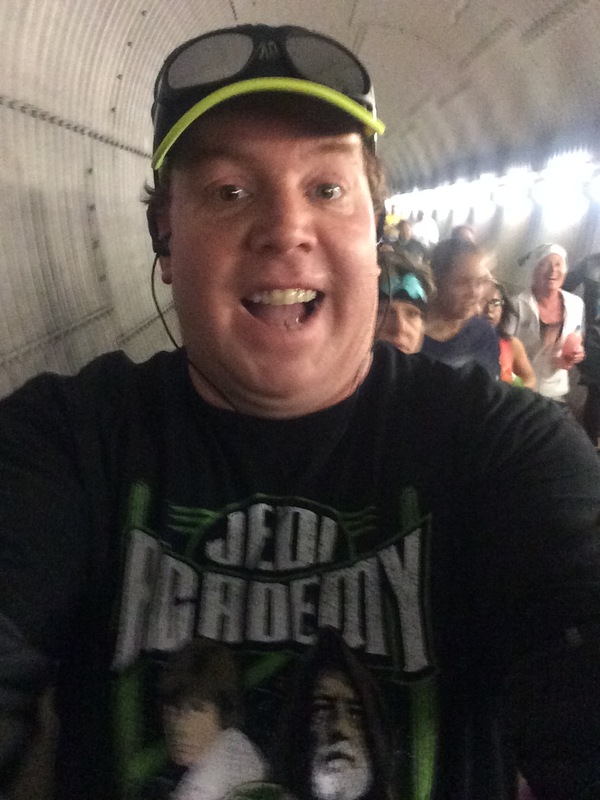 Once I got past the 501st, and posted a pic to Instagram again, it was time to get back to my intervals. Run 30 seconds, walk 90 seconds. It was in mile 11 that I started to feel fatigue. My legs were getting a little heavy. However, I kept going with my intervals. Mile 12 was slightly faster than mile 11! However, by mile 13, I realized I was going to be over 3 hours. So, I didn’t push as hard. I wanted to enjoy as much as I could. 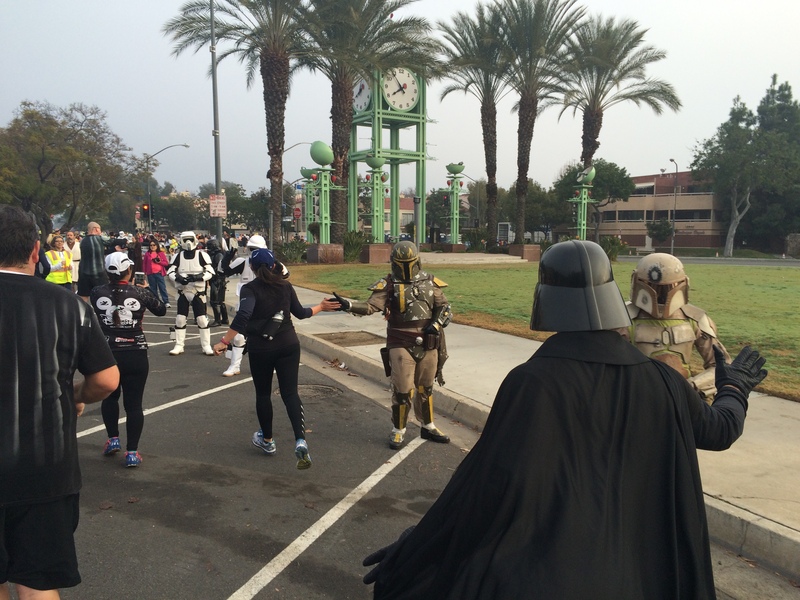 We actually had a slightly different finish from last year’s Star Wars Half Marathon. 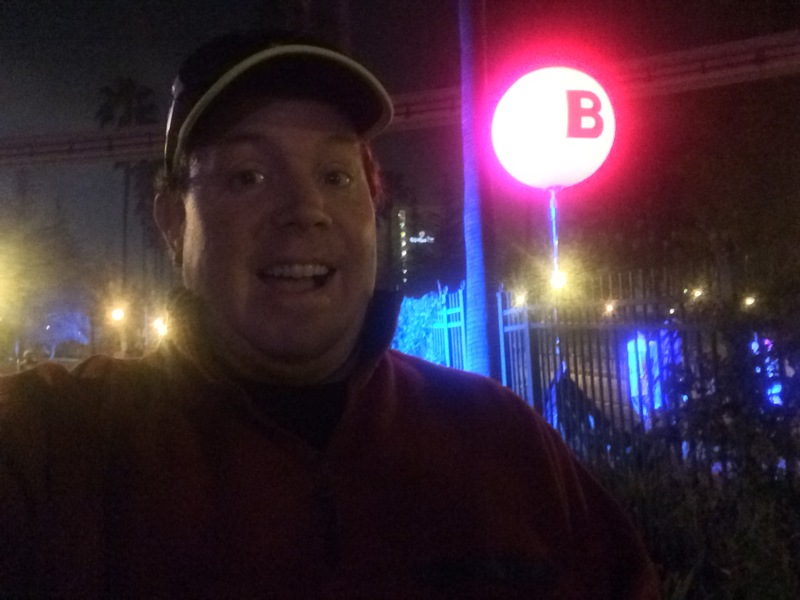 Instead of making the turn into the parking lot by the Paradise Pier Hotel, we ran right by the front of the hotel and turned in closer to Downtown Disney. However, we did have a very familiar finish! This is another part of the races I love. So many people out to cheer us on. I kept going with my intervals even though I was off my goal time. I wanted to finish strong. 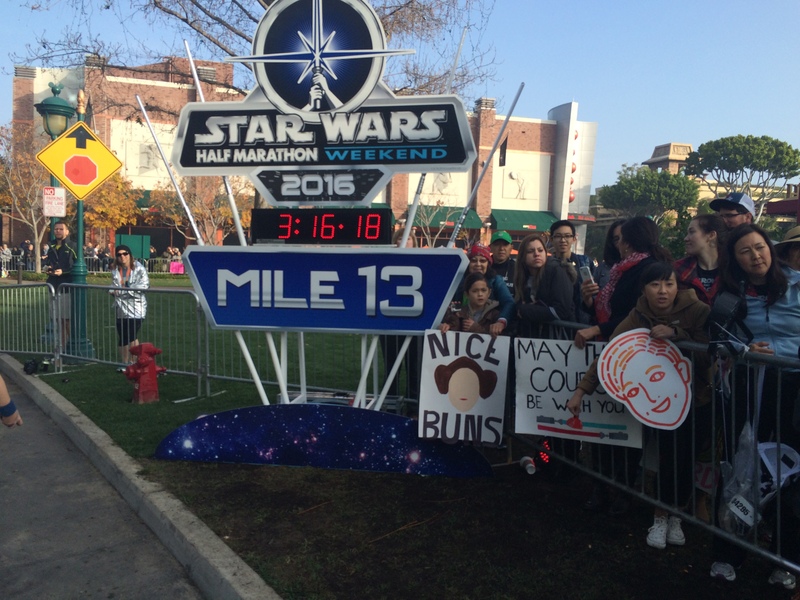 Luckily, I came to the end of a run interval right at the mile 13 marker! This is always a sweet sight! Only 0.1 miles to the finish line! 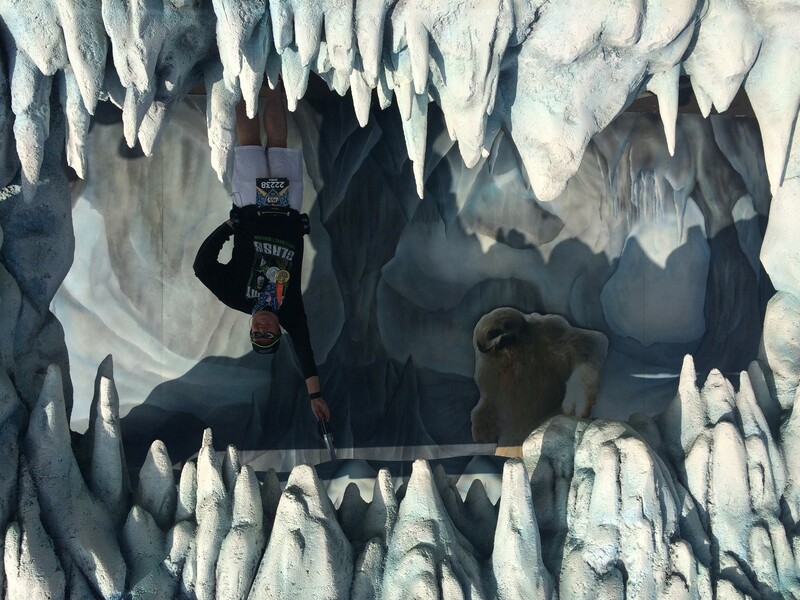 After getting my medals, I headed over to the special Hoth photo op. As you might imagine, I flipped this photo upside down because that’s how the scene is supposed to look. 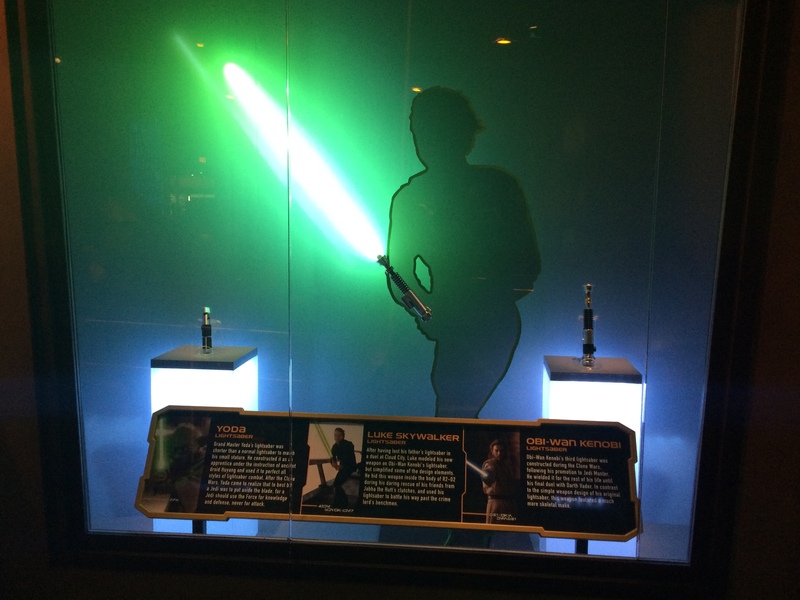 However, I was actually standing and reaching up for the light saber. How much fun! As I walked around, I got to see my friends Kim and Gail. 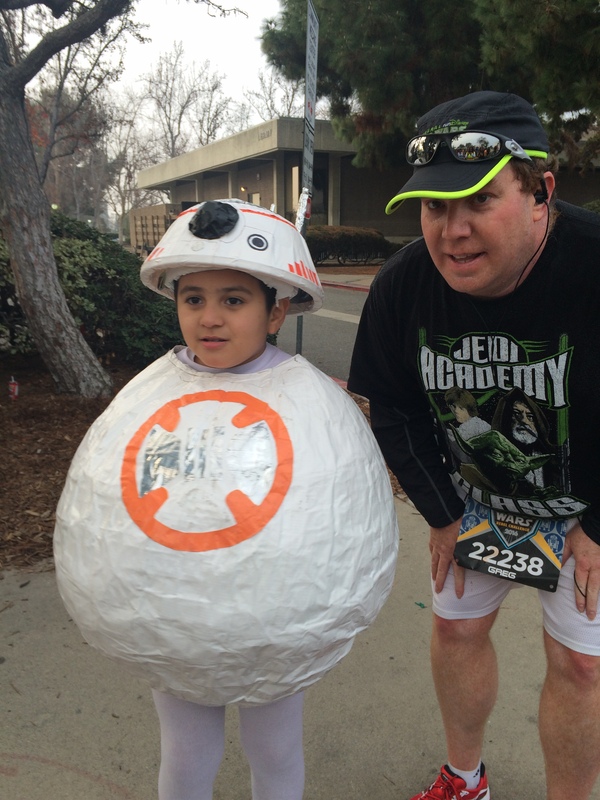 Last year, they ran the Star Wars Half Marathon as a mash up of Tinker Bell and a Storm Trooper. 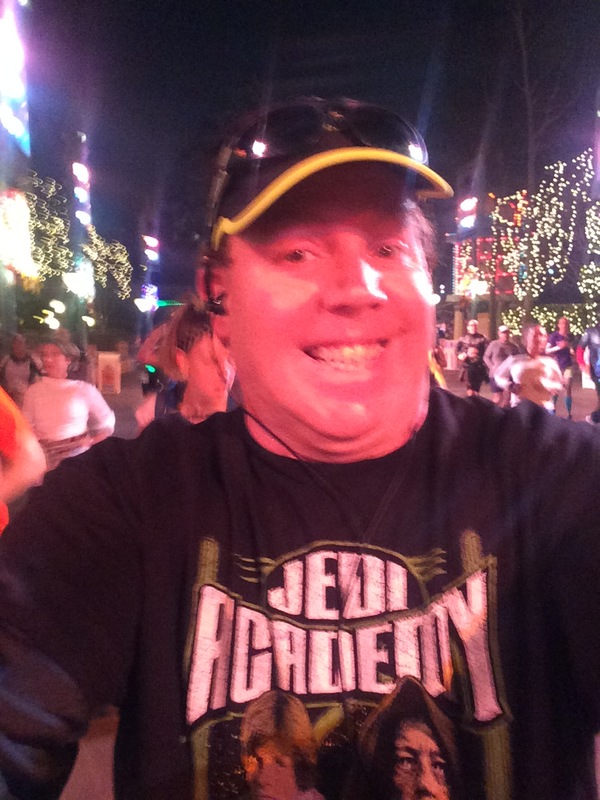 It was sort of a salute to the fact that the Tinker Bell Half Marathon had occupied that weekend the year before. 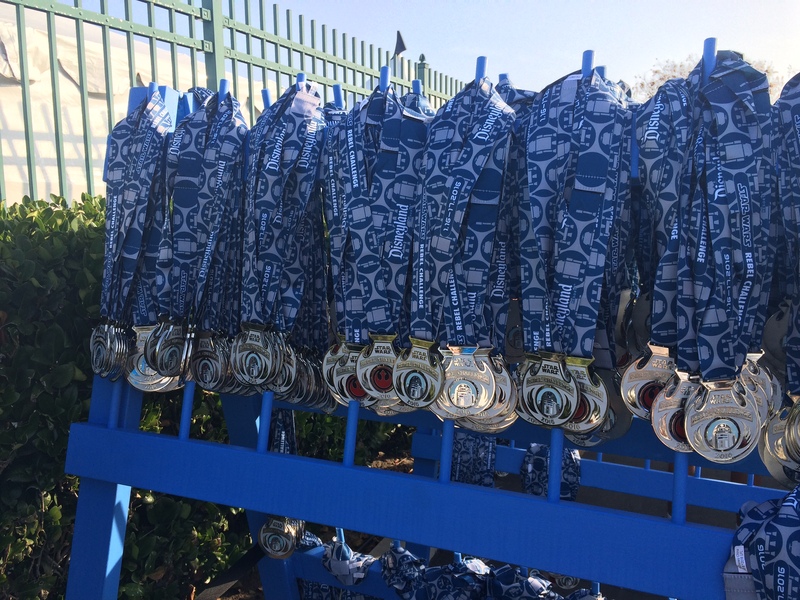 So, it combined both half marathon weekends. This year, they still had the tink wings. However, they had a mash up of Tink and Princess Leia. 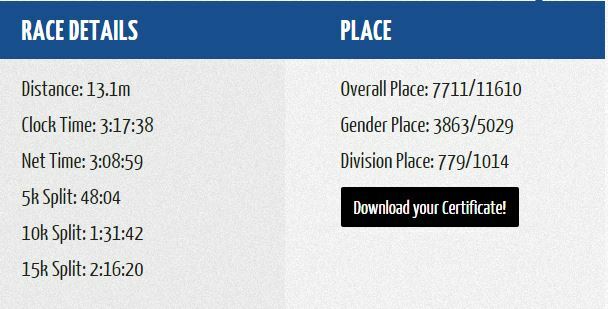 My 2016 Rebel Challenge was now complete. Here are the splits according to my Nike GPS Sport Watch. Of course, they don’t represent where I was at each mile marker on the course. According to the watch, I ran 13.44 miles. Here are the official results. As you can see by these splits, I got faster as the race went along. Also, I got the splits emailed to me on the course. 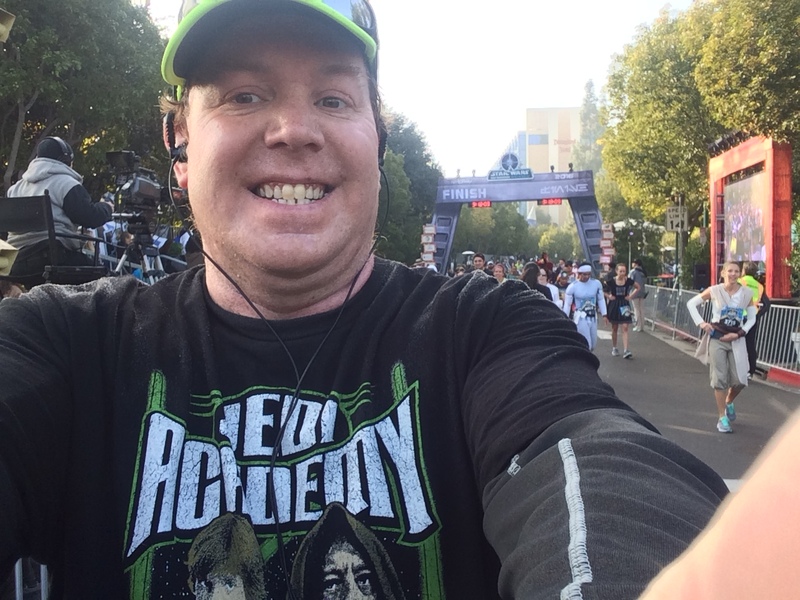 At the 5K mark, my estimated finish time was 3:22:46. At the 10K mark, my estimated finish time was 3:13:27. 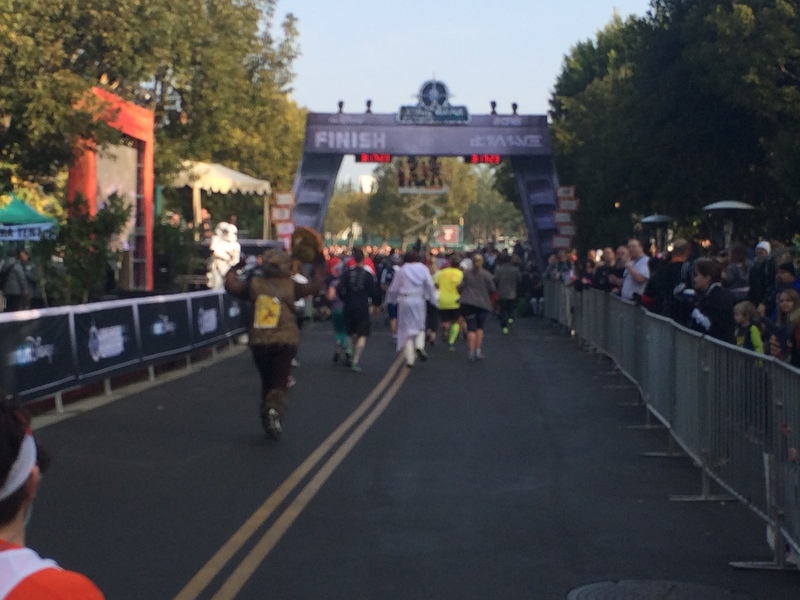 At the 15K mark, my estimated finish time was 3:11:45. 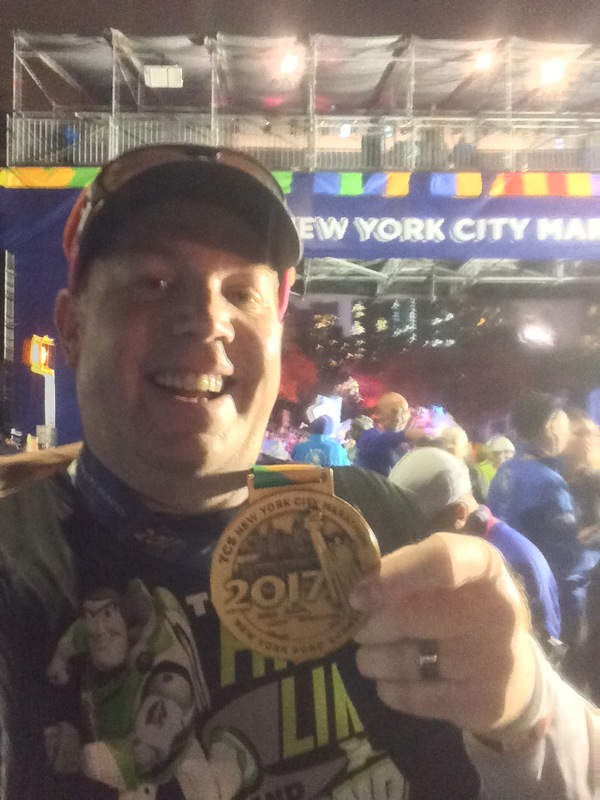 I finished in 3:08:59. 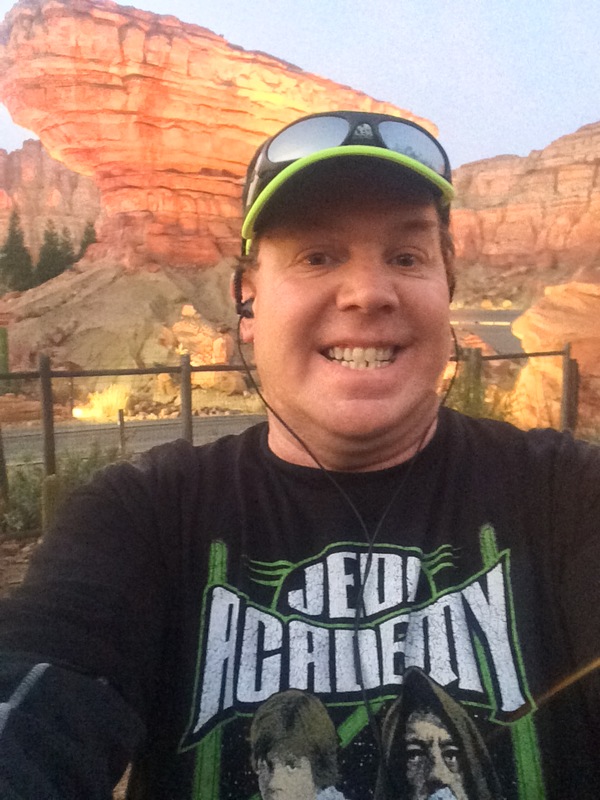 One of these years, I’m going to actually race a runDisney race at Disneyland without the picture taking and stops just to see how fast I can go. After getting cleaned up after the race, I headed off to Disneyland for some fun. Up first? 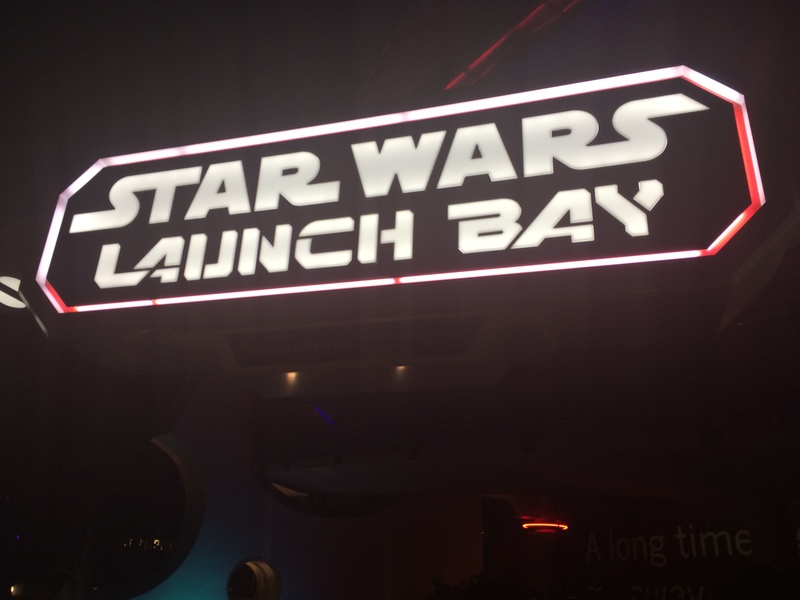 A trip to the Star Wars Launch Bay in Tomorrowland. So, I had this idea for a fun medal pic. At the end of Star Wars Episode IV: A New Hope, Luke and Han get rewarded for blowing up the Death Star with medals. 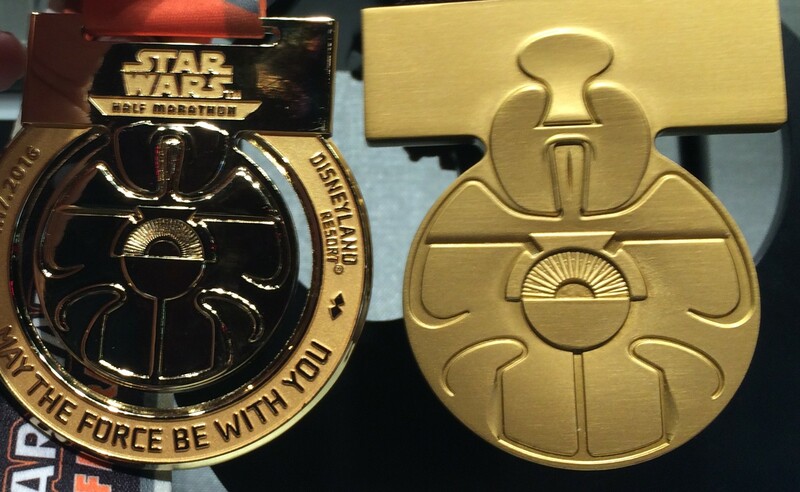 The Star Wars Half Marathon medal for this year and last year was in the design of those medals. 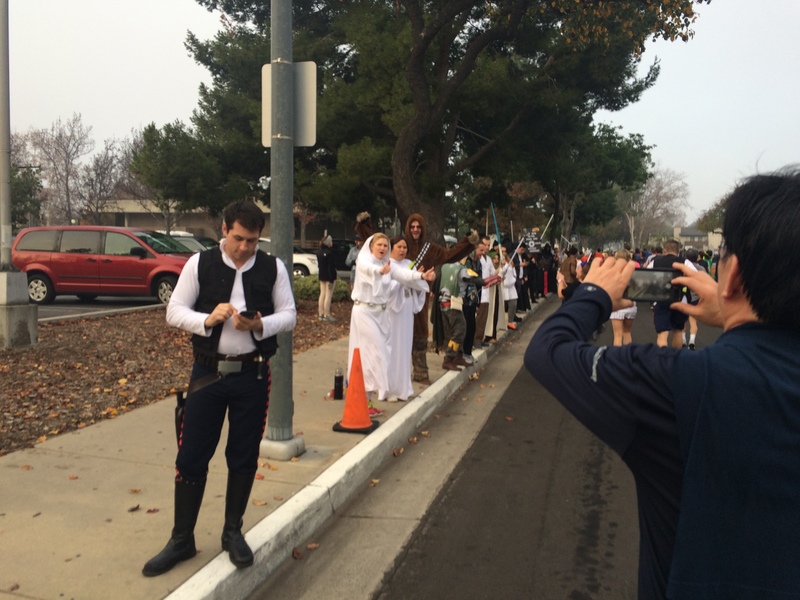 Chewbacca didn’t get a medal. Many of us Star Wars fans thought he was robbed. 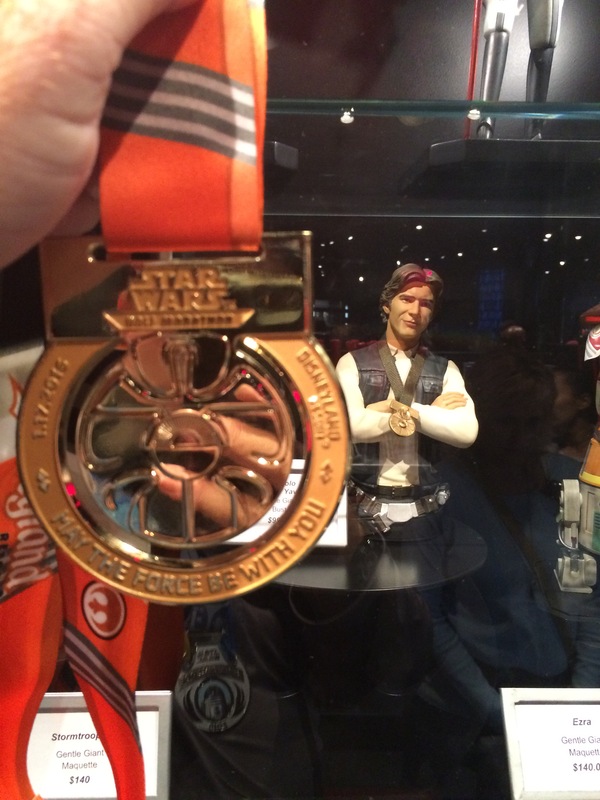 So, I brought my 2015 Star Wars Half Marathon medal and thought it would be fun to get a picture with Chewbacca wearing that medal. Sort of like he finally got his medal. The Disney cast member wouldn’t allow it. She said it was, “because he has one at home.” I quickly corrected her because she clearly didn’t know. Then, she replied that Chewie’s medal was in the mail. 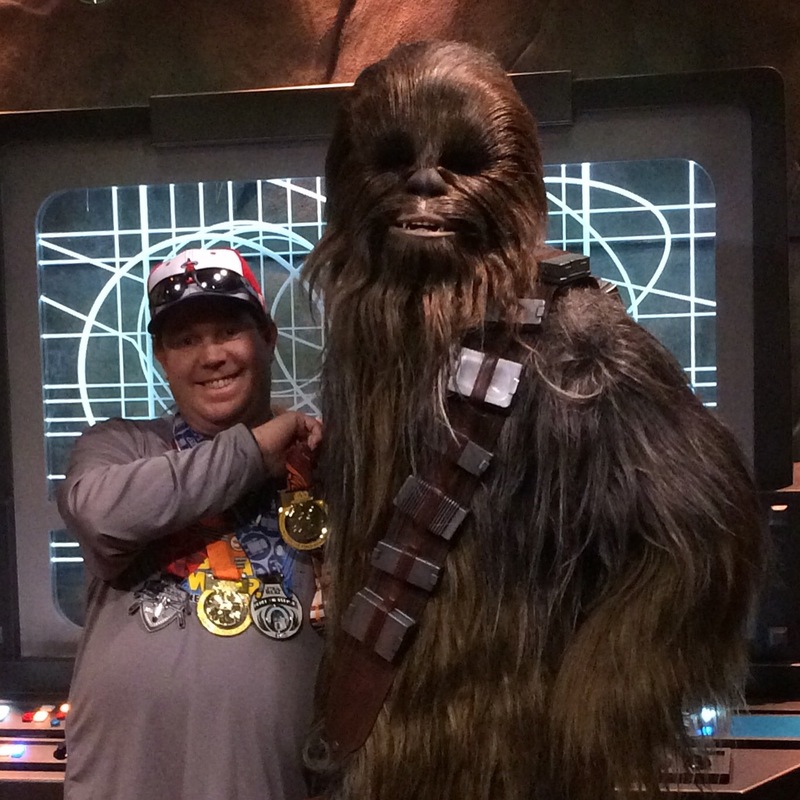 She did allow me to hold up the medal by Chewbacca. It was a compromise. Oh well. It was a good idea. 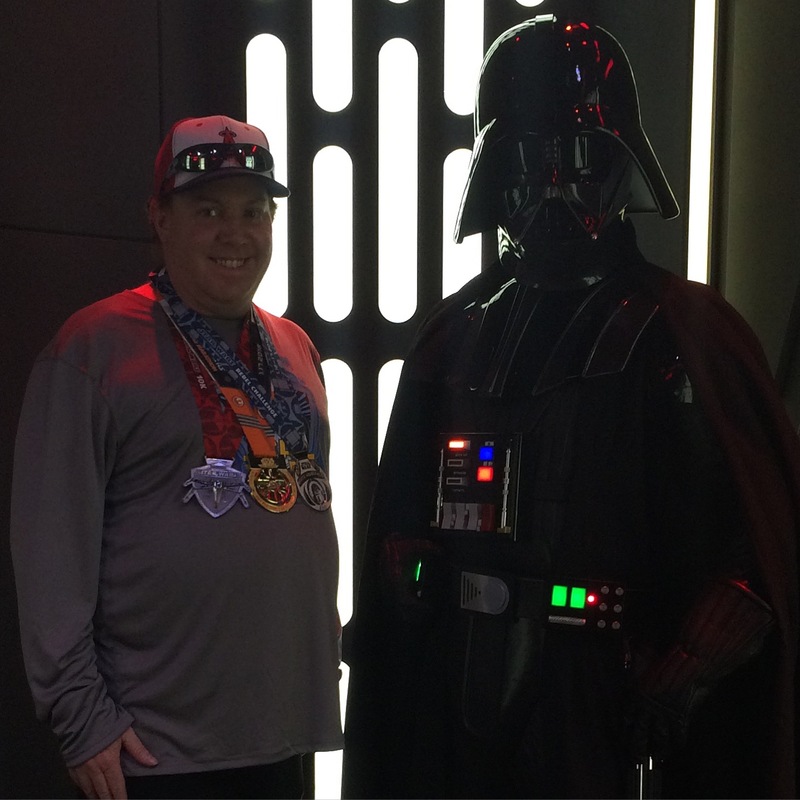 After Chewbacca, I headed over to the Dark Side to meet Darth Vader. 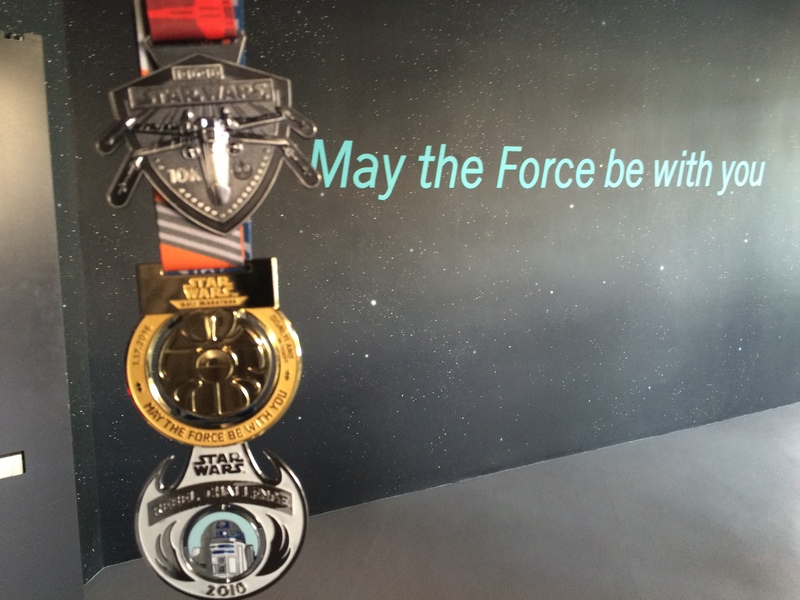 Darth Vader was impressed with the medals and tried to get me to join him on the dark side of the force. 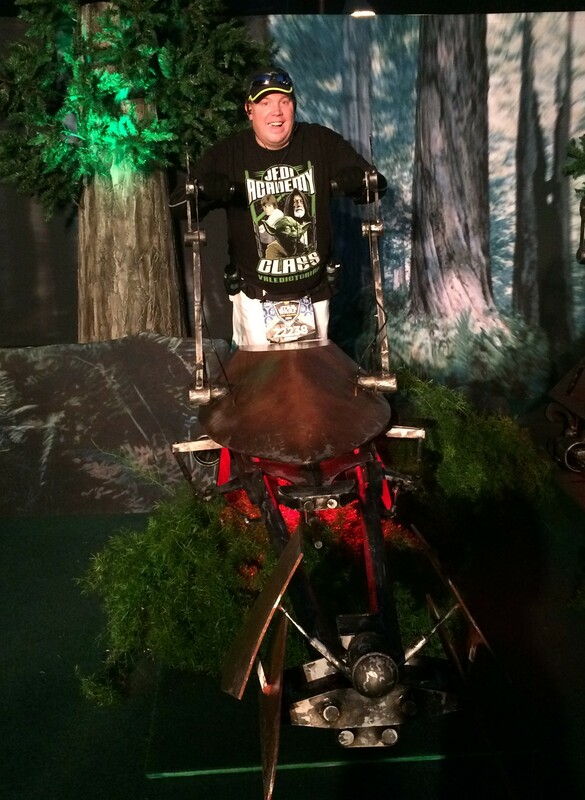 Then, I headed off to take in Star Wars: Path of the Jedi. I love this little film. If someone wants to know what Star Wars is all about, show them this film as a good summary. 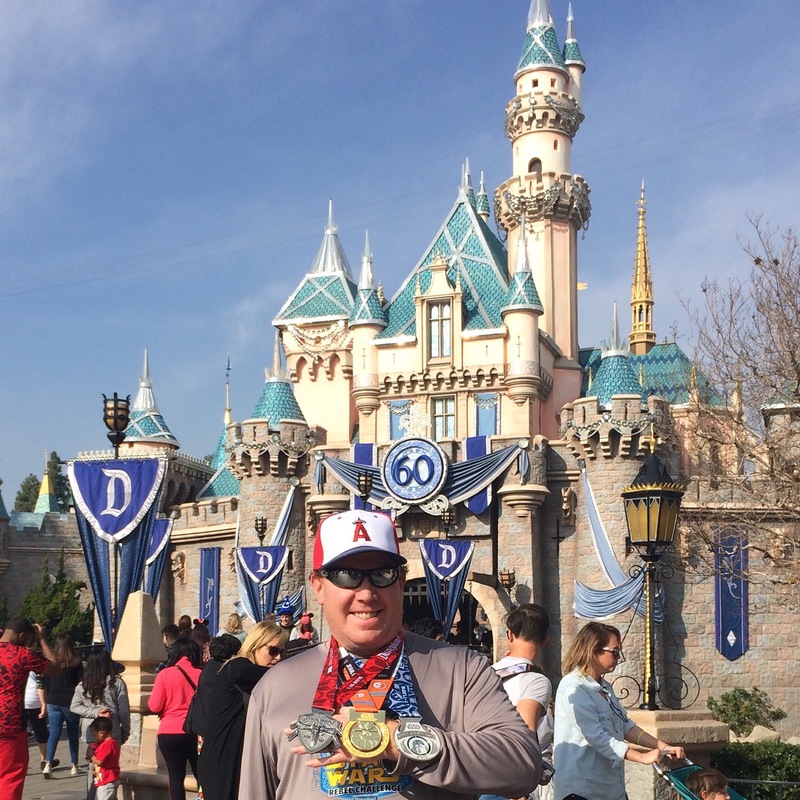 I also had to get the obligatory photo with my medals in front of Sleeping Beauty’s Castle. It was great running into you again after this race! Still can’t believe I’ve seen you twice out there, what are the odds? ?